Dubai is no backpacker city by any means! In fact, the category “hostel” doesn’t even exist here, let alone the term “backpacker”. 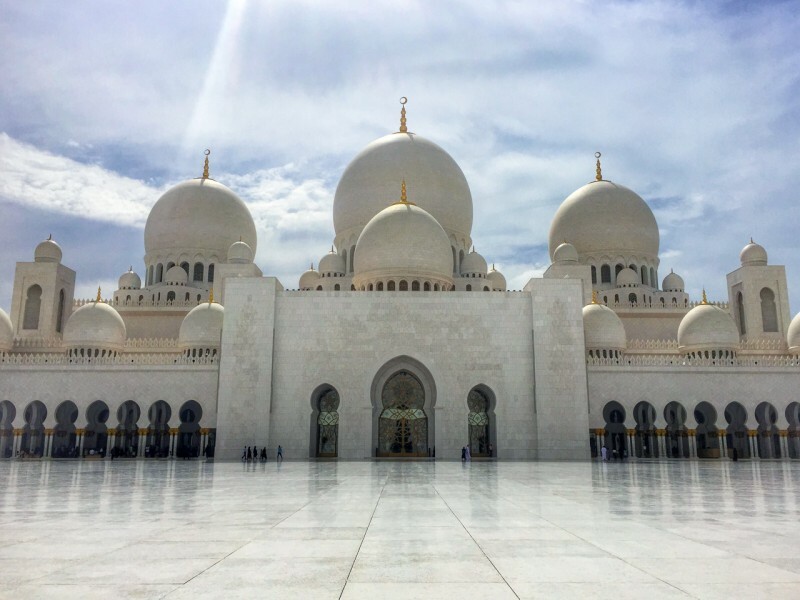 We originally allocated just 4 days for Dubai and planned to spread the rest of our time over Egypt or Jordan but unfortunately, with the travel warnings issued and the extremely pricey airfares, we ended up staying in Dubai for 10 days… yikes! OK, it’s time to get organized, get our budget in check, figure out where on earth are we going to stay for 10 days, how will we get around and what to do with our time. The Burj Khalifa is a one of a kind building and currently the world’s tallest man-made tower at a whopping 830 meters. At night it lights the city up and by day, it’s impossible not to notice. 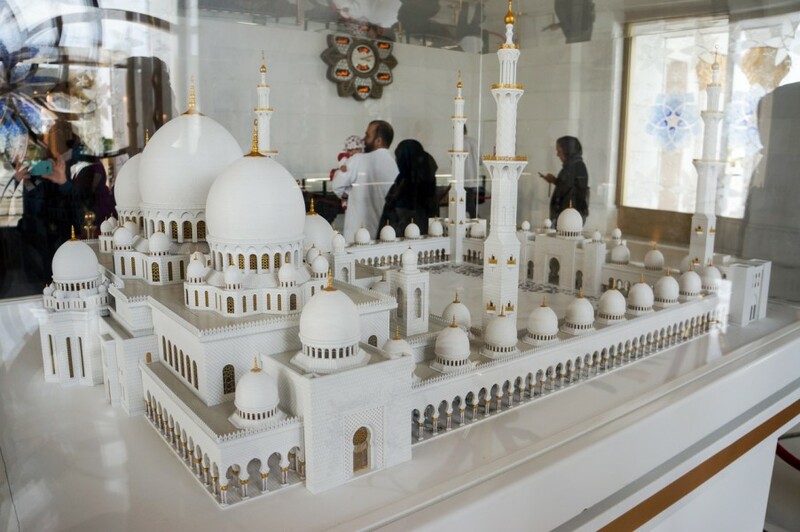 The building opened in January 2010 after 6 years of construction and has now broken 18 world records. 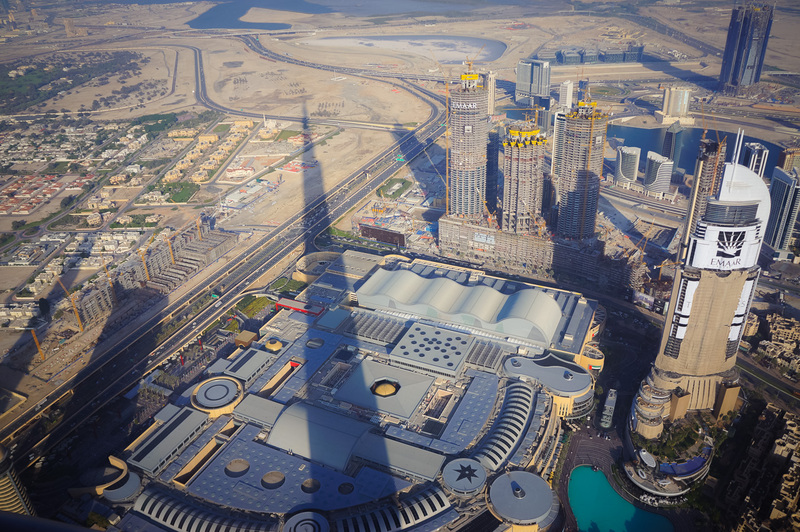 Visiting the Burj begins in the lower level of the Dubai Mall and throughout your way to the top, you can watch the multi-media presentation about the Burj’s construction. There are 3 levels you can visit; 124, 125 and then ‘to the top’ at 148. We only went to 125 and felt it was high enough but if you want to go to the very top it adds quite a lot to the already expensive ticket price. Tickets are available online here and we recommend to buy prior to visiting. We spent quite some time up there (making use of the price we paid!) 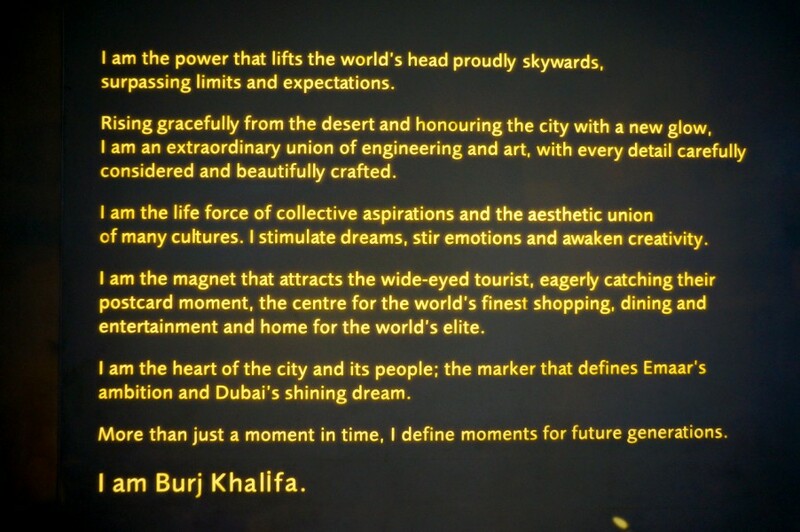 and by doing so we were able to see Dubai in daylight, sunset and twilight and it was awesome seeing the city change over the time of the day. It’s not 100% necessary but if you have the time, it’s worth it. 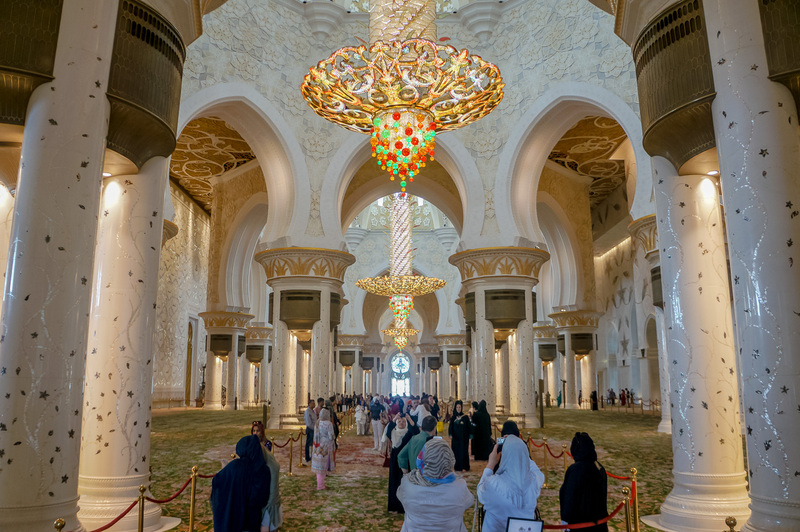 Note: If you visit after 5:30 pm the cost of admission is reduced to 125 AED ($34 USD) from 200 AED ($54USD). 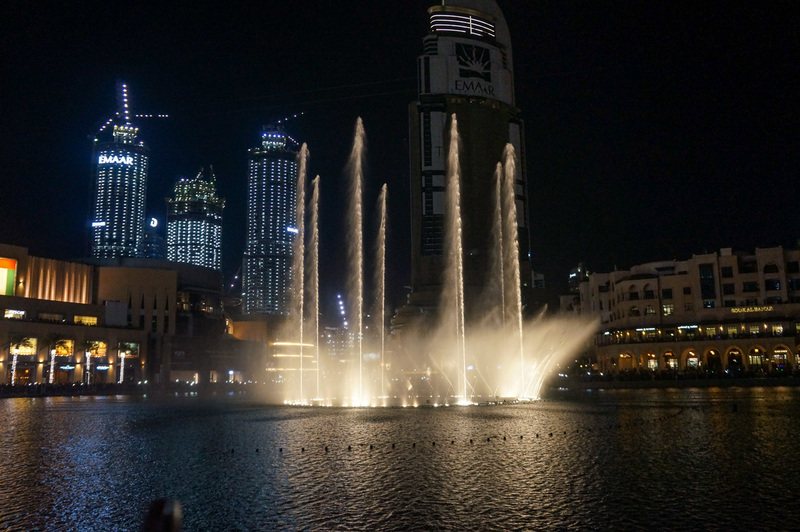 At the base of the world’s tallest tower is the world’s largest dancing fountain. The fountain performs to a range of different songs from classical to contemporary Arabic and world music. 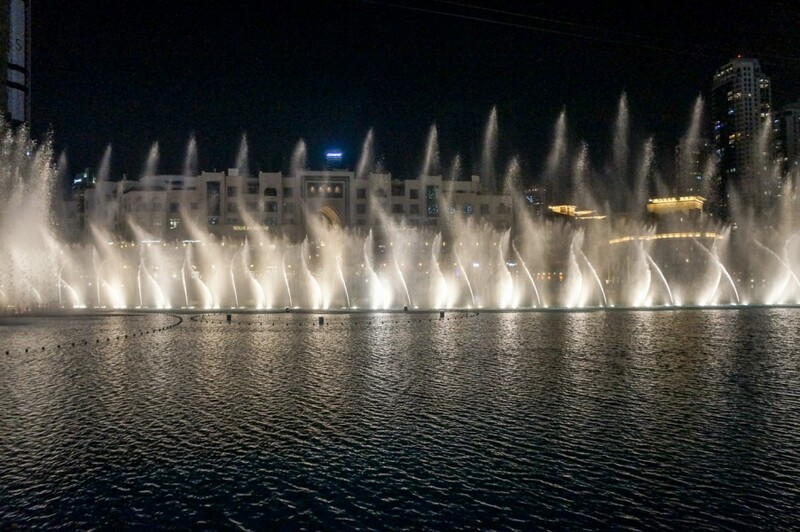 When playing, the fountain has over 22,000 gallons of water in the air at any given moment. The show will last about 4 minutes, generally for the duration of the song. 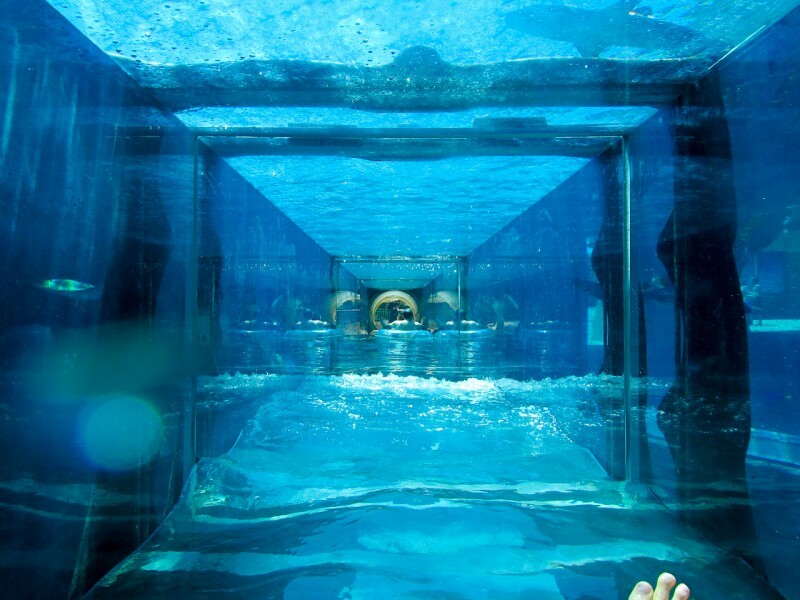 When in motion, it shoots water as high as 500 ft, equivalent to that of a 50-storey building, is 900 ft long and has five circles of varying sizes and two central arcs. 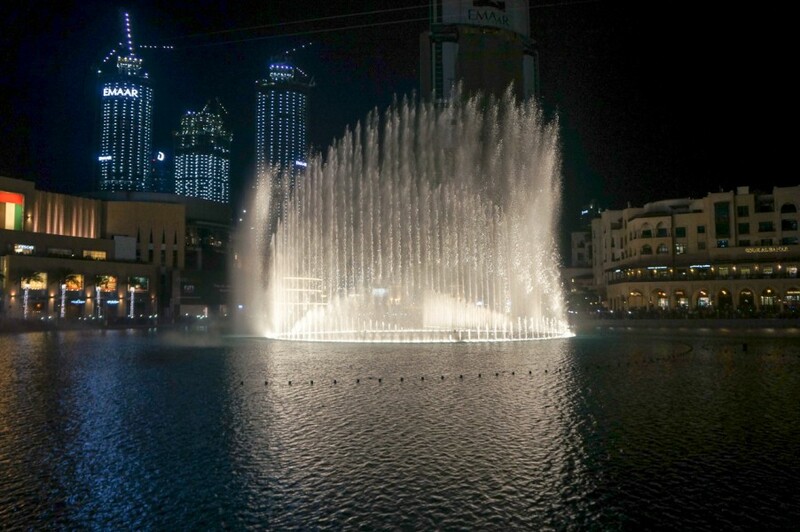 We’ve seen a few dancing fountains before, in Vegas and Barcelona but this fountain was pretty incredible and the flashing Burj behind it, topped it off. If you’re up the top of the Burj, be sure to look down and watch the show from above before heading down to the ground. 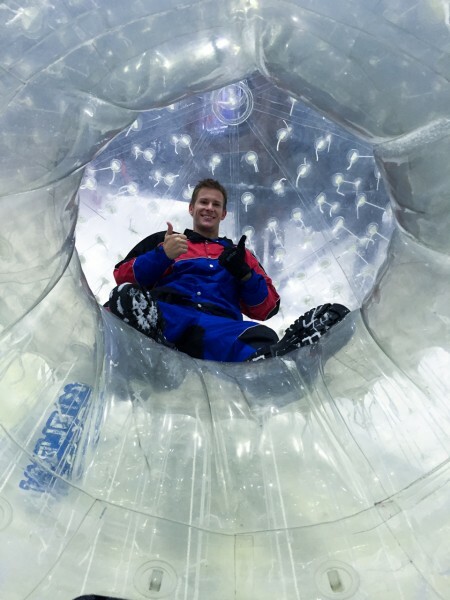 It was a completely different experience. When: Every night starting at 6:00 pm and every half an hour going forward until 11:00 pm. The Dubai Marina is Dubai’s newest part of town and is the largest man-made marina in the world. 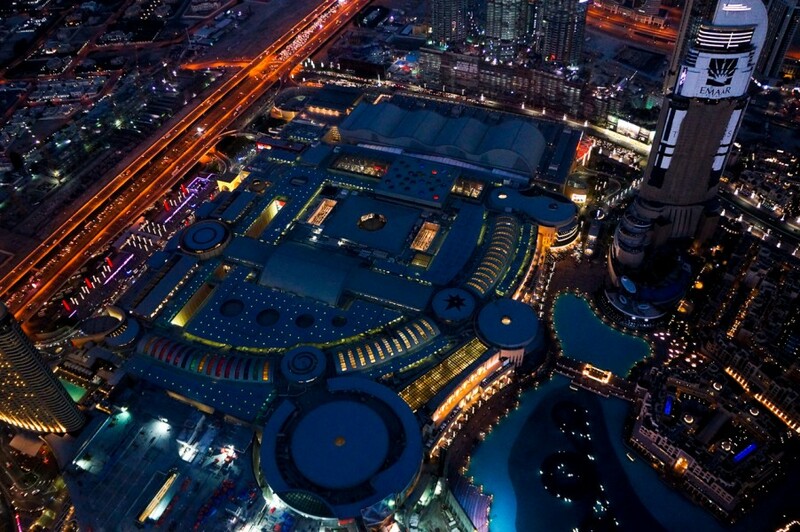 There are many super yachts, high rise buildings, restaurants and the Dubai Marina Mall. 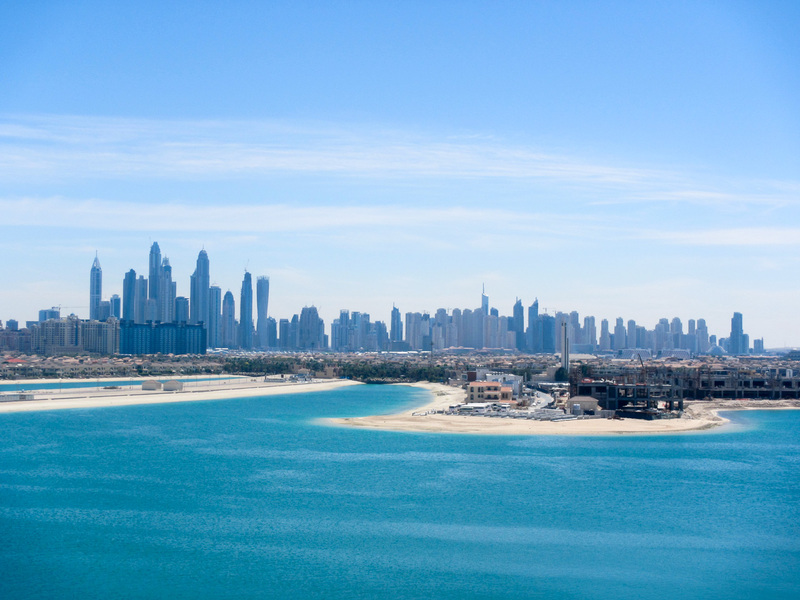 When the entire development of the Marina is complete, it will accommodate more than 120,000 people in residential towers and villas. 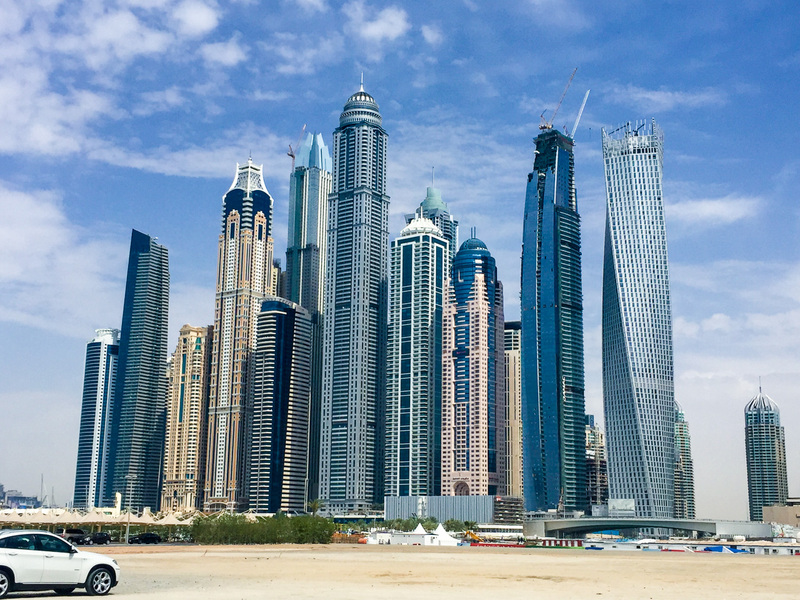 Jumeirah Beach Residence (where we stayed for the last portion of our trip) is a 1.7 km long waterfront community located alongside the Dubai Marina. 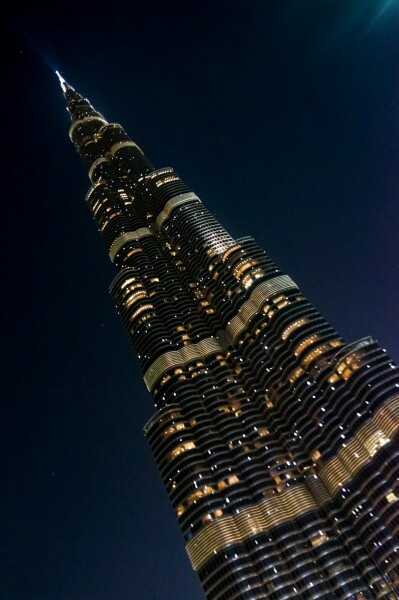 We were lucky enough to find an Airbnb apartment in this giant complex for the last few days of our time in Dubai and the location couldn’t have been better. The area is the largest single phase residential development in the world and contains 40 towers made up of 35 residential buildings and 5 hotels. 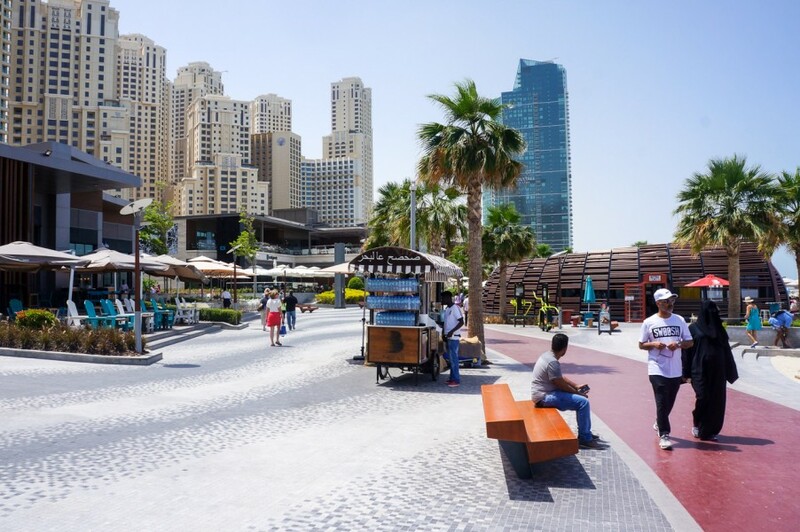 The walk along JBR is one of the most famous parts of Dubai and one of the most visited areas of the city. 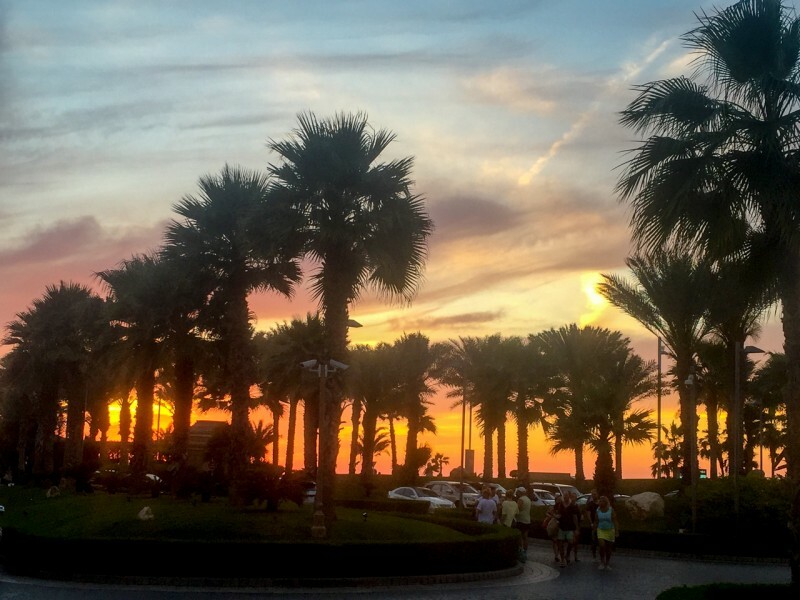 Along the walk, adjacent to the beach, there are hotels, restaurants, cafes, beachfront lounges, outdoor gyms, an outdoor movie cinema, play areas for children, toilets, changing rooms and showers. It is a place to stroll around by day or night. There really is nothing better than being a kid again! 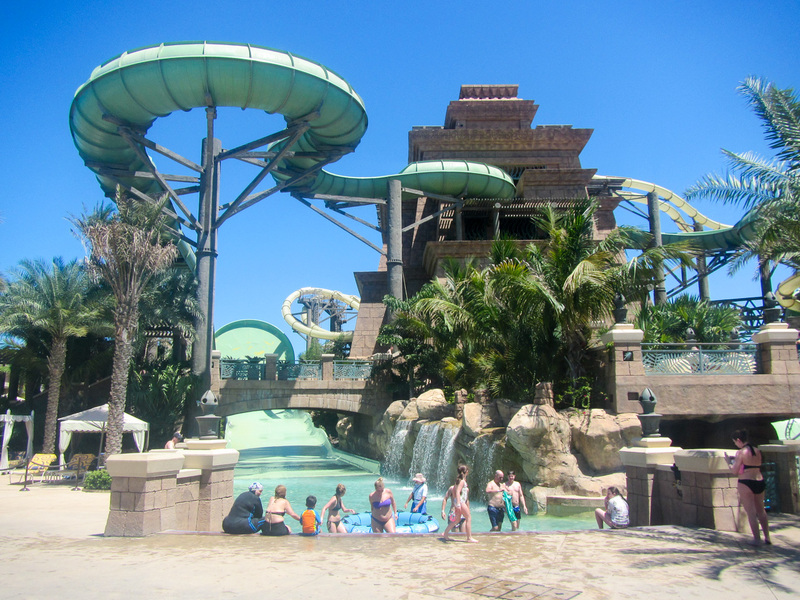 We had the best day at the Atlantis Aquadventure water park and thankfully the crowds were in our favour and we waited no more than 15 minutes for each ride. 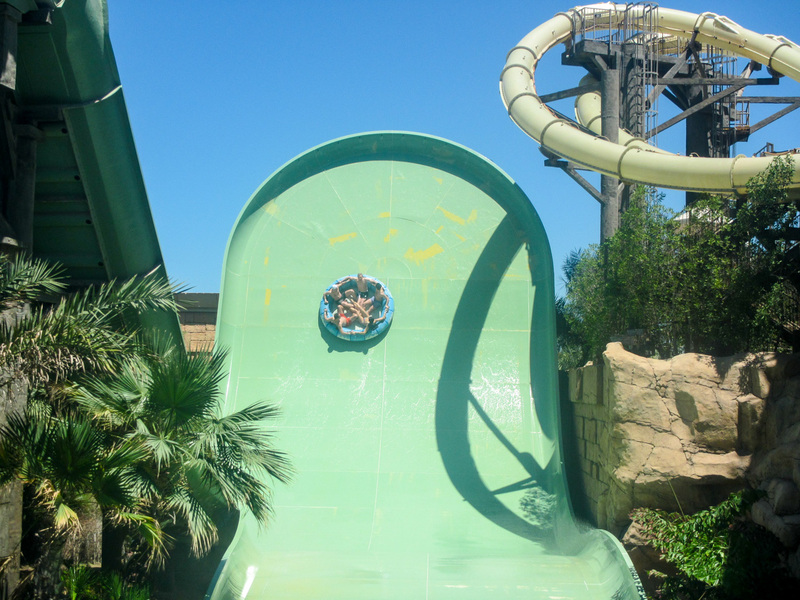 6 hours straight of pure rides and slides! 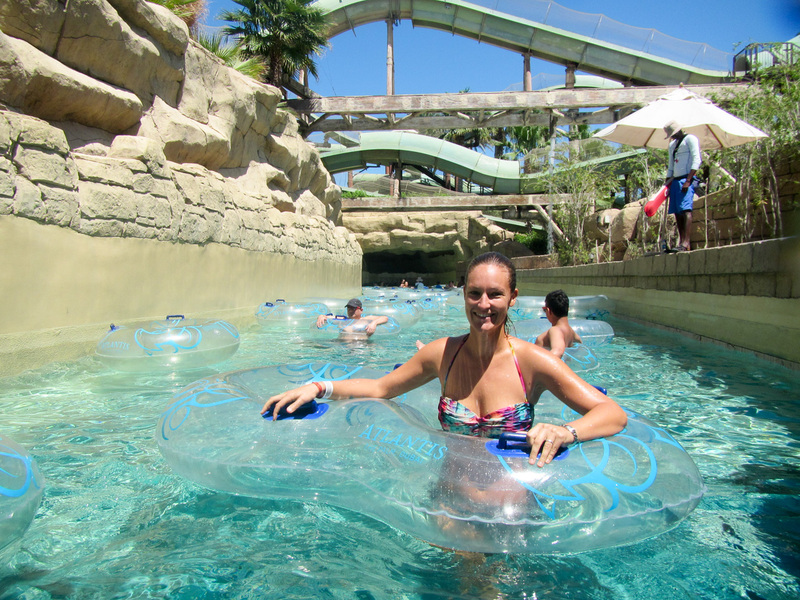 They have a decent selection of rides for people of all size, plus lazy rivers, rapids and it was right on the beach. There are many places to eat inside, but like all theme parks, it is all overpriced. Unfortunately, they don’t allow you to take your own food in but we suggest packing a few snacks to keep you going through the day. They don’t check your bags properly. Unless of course, you want to pay $11 USD for a small popcorn bag. 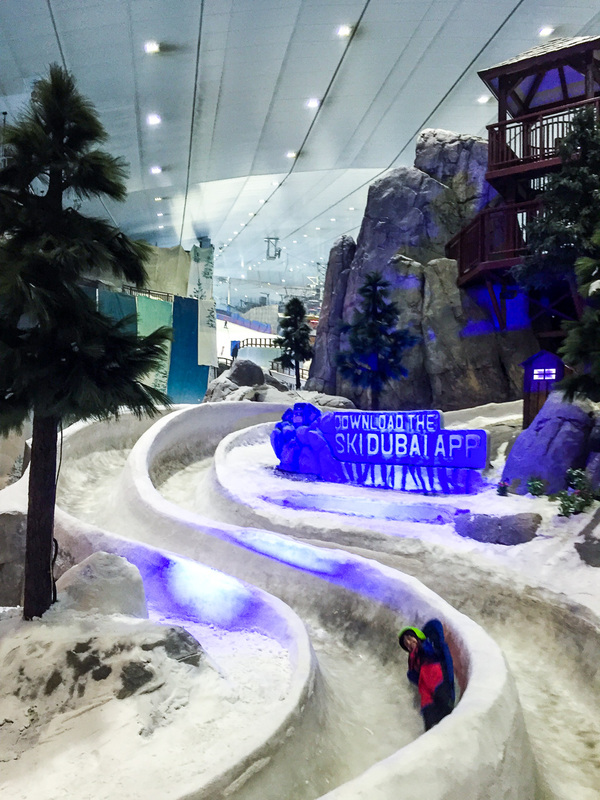 Admission: If you purchase online, 260 AED (USD $71) and at the door is AED 320 (USD$ 87). 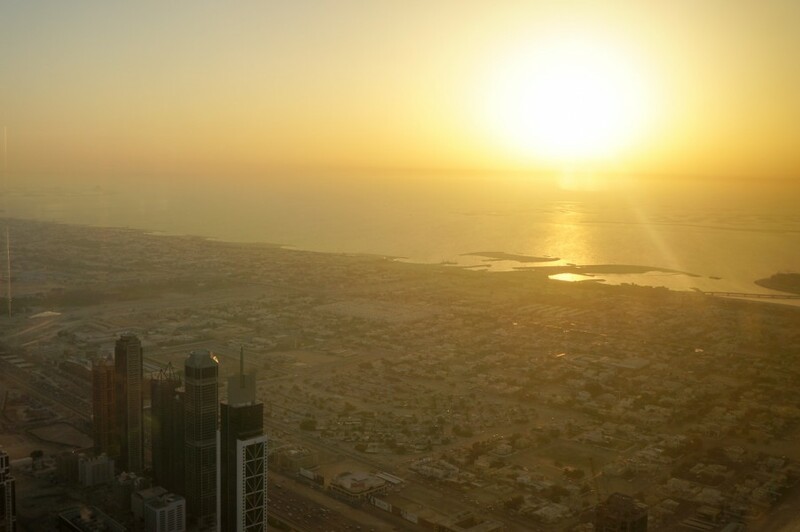 Times: 10:00 am – sunset. Note: Get there before 10 am to get your tickets and unless you want to wait 1.5 hours for a taxi, avoid leaving between 5:30 pm-7:30 pm. 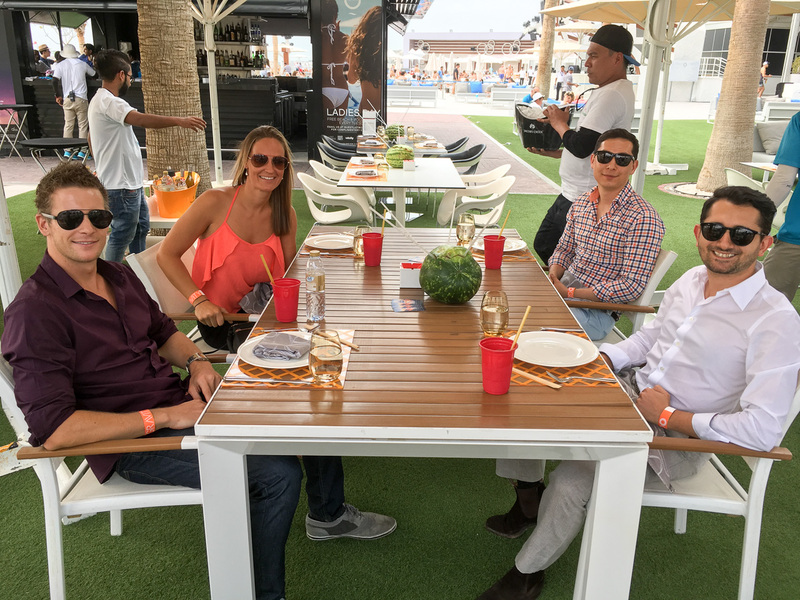 Brunch was one of our favourite things to do when we were living in NYC so we were super excited to hear that it’s a thing in Dubai too… Dubai style of course. 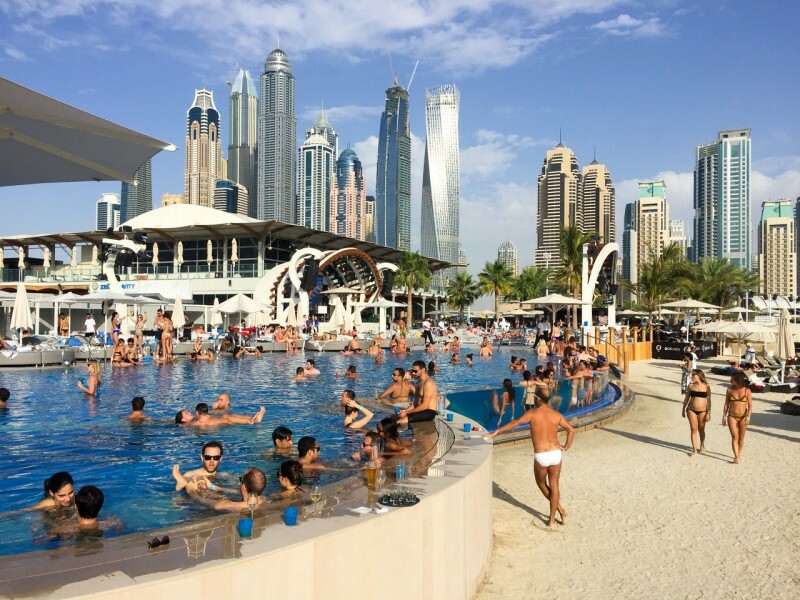 The work week runs from Sunday-Thursday, therefore, Friday in Dubai is our typical Saturday. 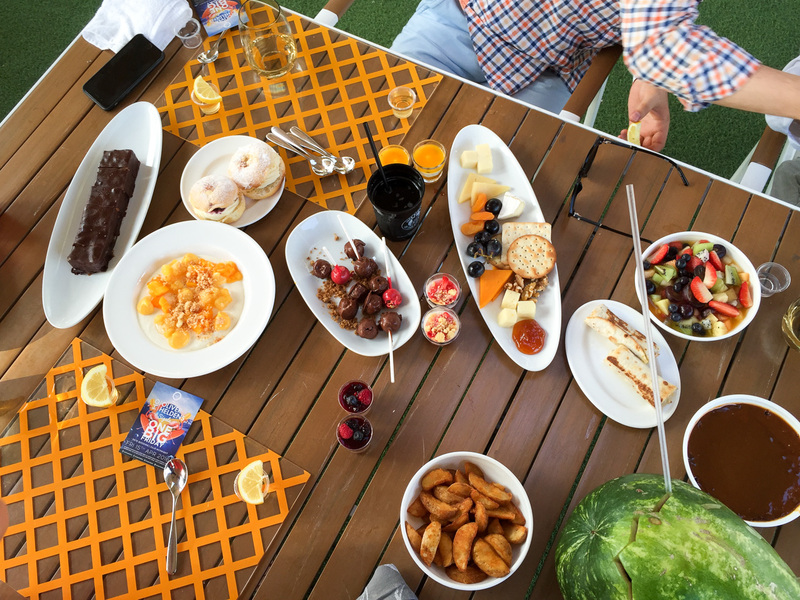 Most hotels and larger establishments put on a Friday brunch and it consists of all you can drink and eat, with prices ranging due to the package you choose and establishment you attend. 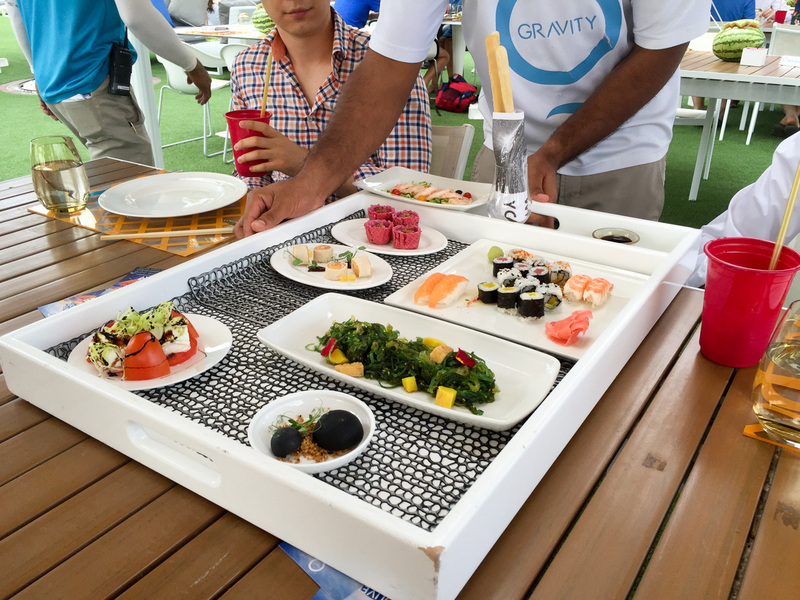 We had our brunch at Zero Gravity, which is located right on the beach at the other end of the Dubai Marina. 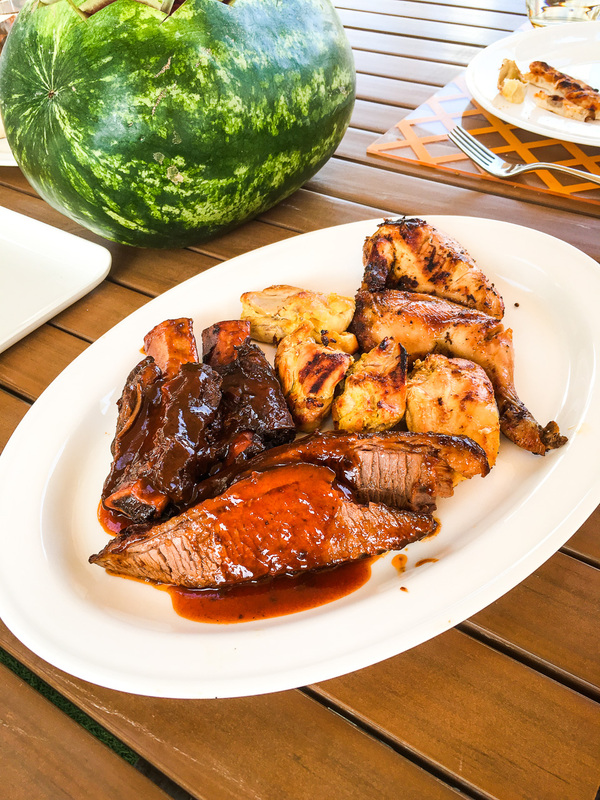 They brought out a range of different cuisines along with an entire table of desserts to finish. 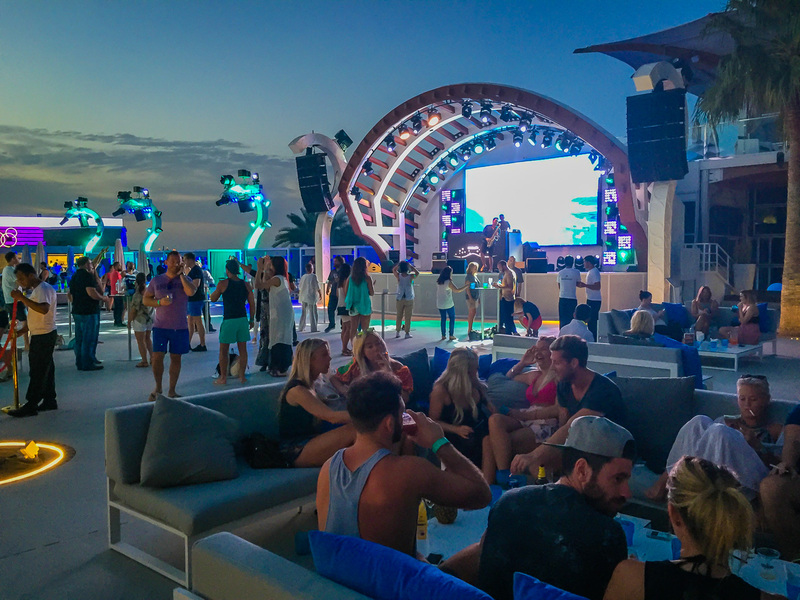 It was the perfect spot, with upbeat staff, decently priced (for Dubai), laid back, delicious food, sun, friends and fun music! 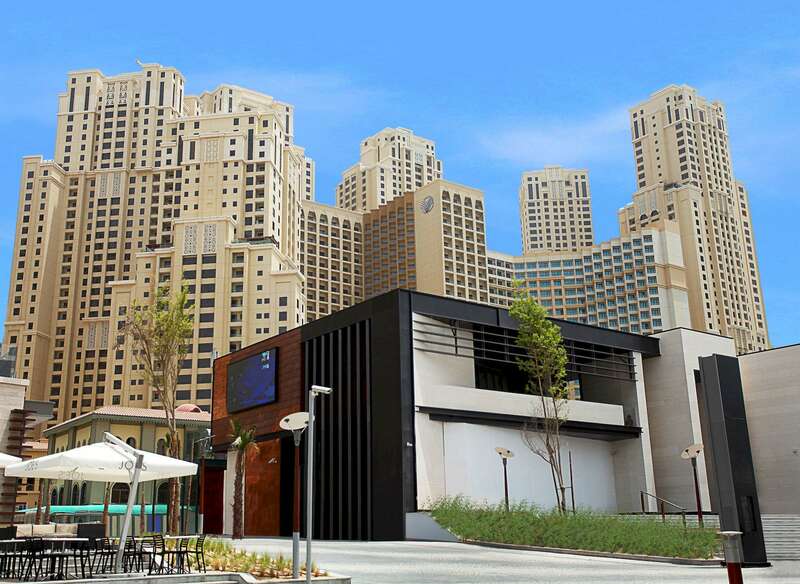 Be sure to check out one of these brunches if you’re in Dubai on a Friday! Our package was US$100 for the full experience. 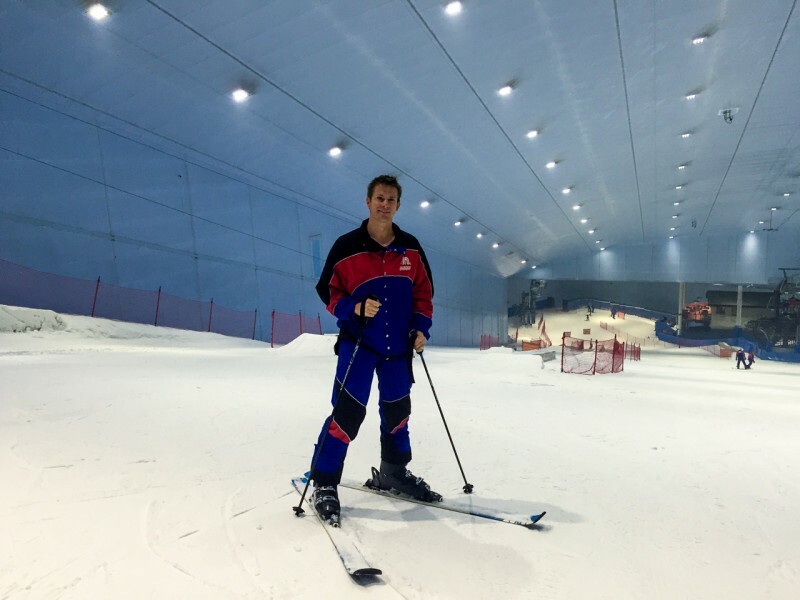 Skiing in the desert? Why not! Only in Dubai. 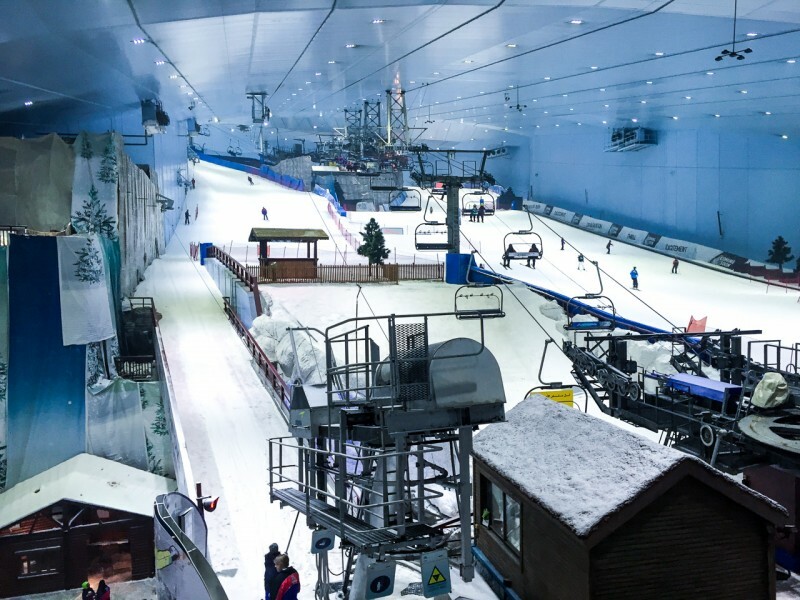 Ski Dubai, located inside the Mall of the Emirates, is the first indoor ski resort in the Middle East and offers a pretty impressive winter setting to enjoy many different activities. 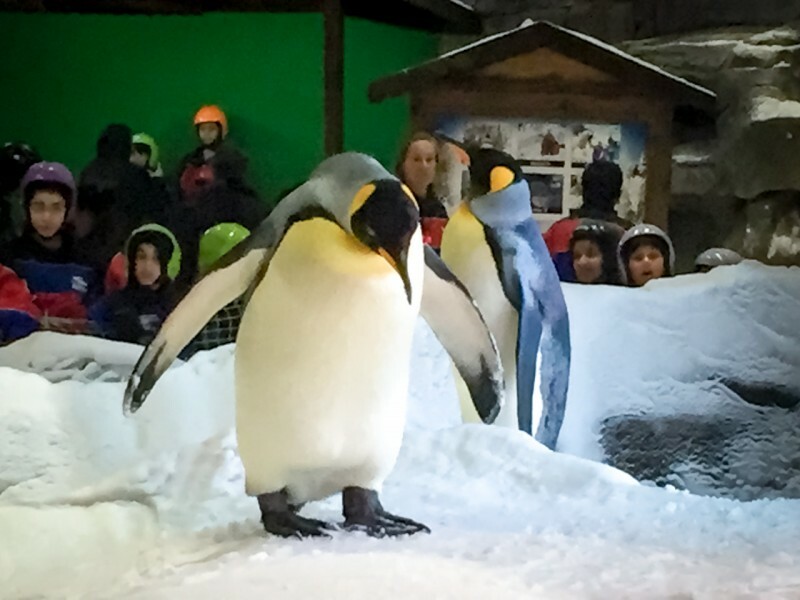 Not only do they have skiing/snowboarding, you also have the option to meet the penguins, go tobogganing, tubing, sledding, and rolling down a hill in a giant inflatable ball (no thanks!!). 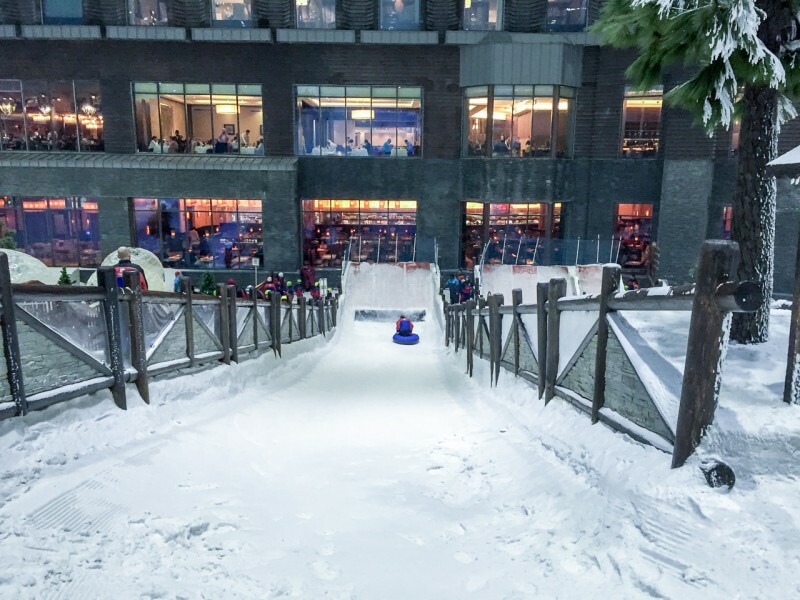 No matter your age, there’s something for every snow lover in here. 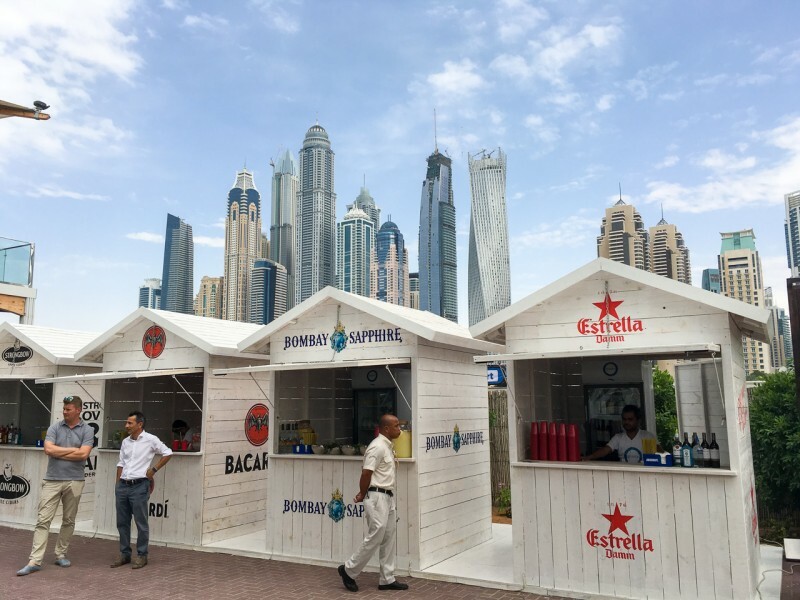 Based on what you want to do inside, they have separate packages with a range of costs from 150 AED ($41 USD) to 325 AED ($89 USD) Find all the prices here. Note: There’s no need to pack your entire wardrobe of ski gear, included in the price you are given a winter jacket, pants & gloves. 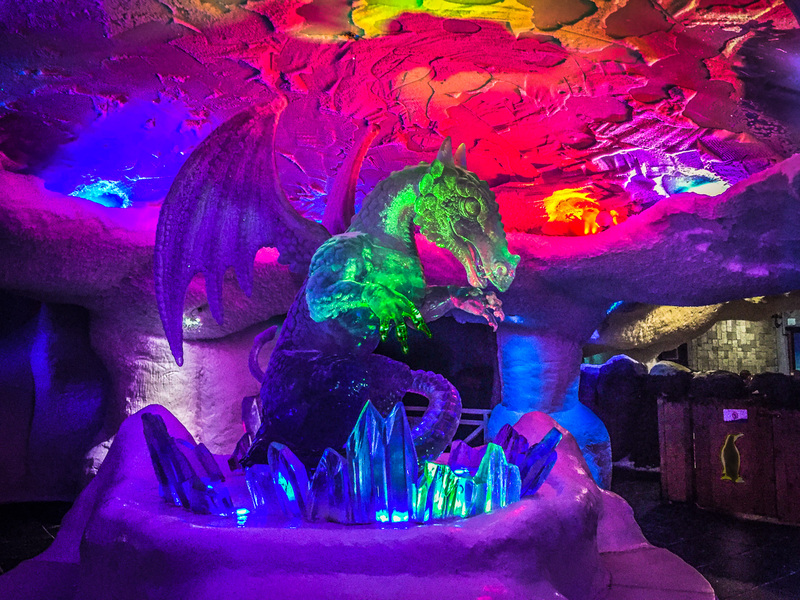 However, we do suggest bringing a sweatshirt, beanie or warm scarf, the temperatures in here are -5 degrees Celsius! 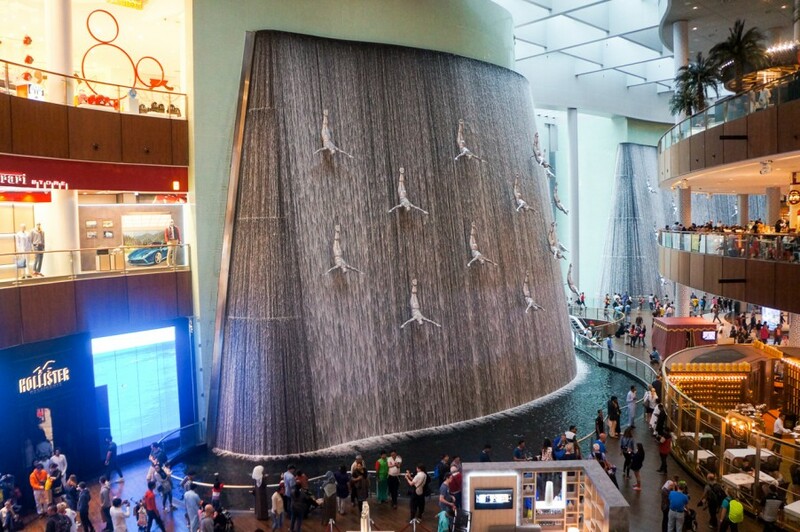 The malls in Dubai are just ridiculous. Not only are there 100’s of them, none of them are by any means ‘small’. 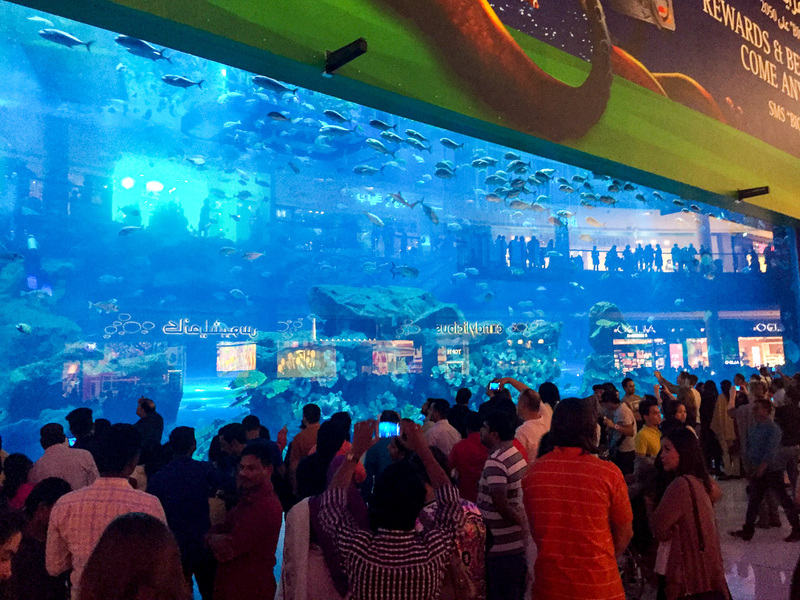 The Dubai Mall is not one to be missed but make sure to allow at least 3+ hours to get around, after all, there are 1200 shops to check out! 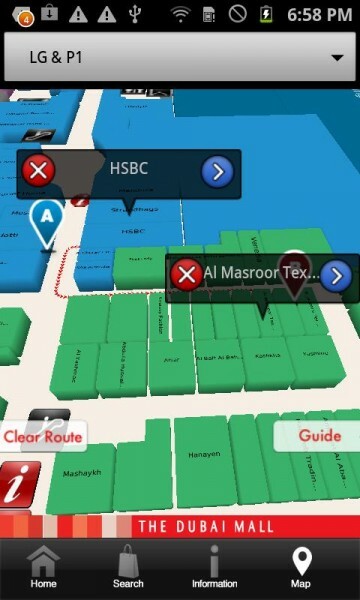 If you think you’ll get lost, don’t worry, they’ve got you covered, they have a 3D app that will give you step-by-step directions on how to get to the store your looking for. Thank goodness because we found ourselves lost more than once. 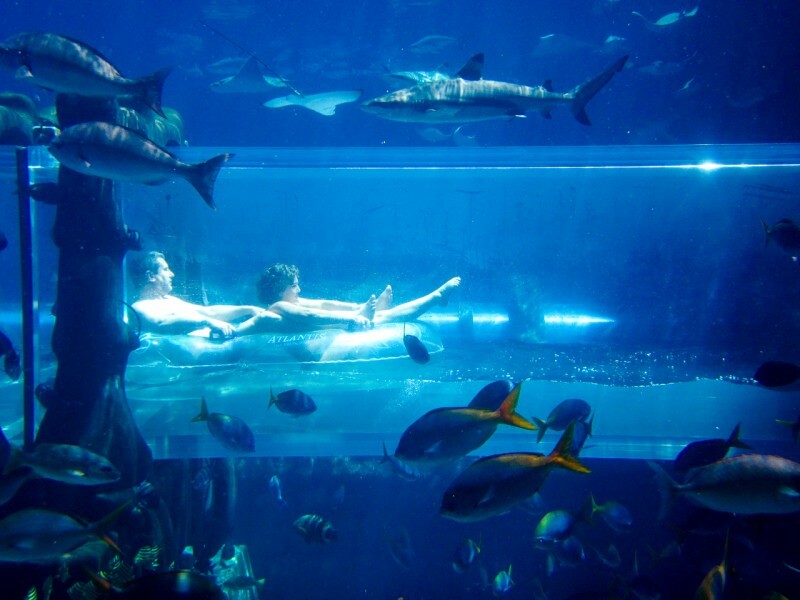 If you’re finished with shopping, they also have an ice rink, movie theatre, underwater zoo, aquarium, waterfalls and the famous fountain show. Mall of the Emirates is also a popular mall however it does have almost half the amount of shops of the Dubai Mall, which makes it much less overwhelming and much easier to navigate. The Burj Al Arab (Tower of the Arabs) is the world’s only 7-star hotel and reaches a height of 321 meters. The shape of the structure is designed to mimic the sail of a ship and is one of the most photographed structures in the world. 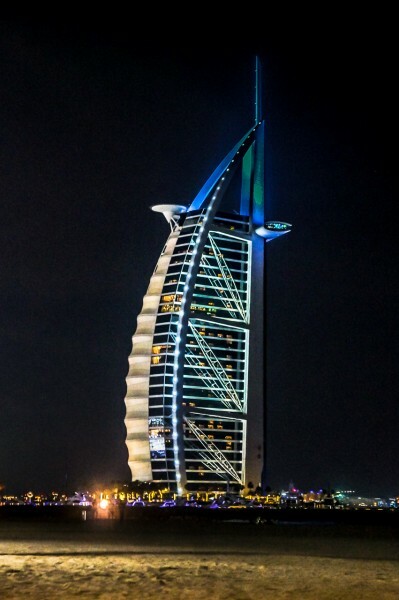 You think of the Dubai skyline, you think of this hotel. Illuminated with a range of colourful lights, it makes for an impressive building day or night! 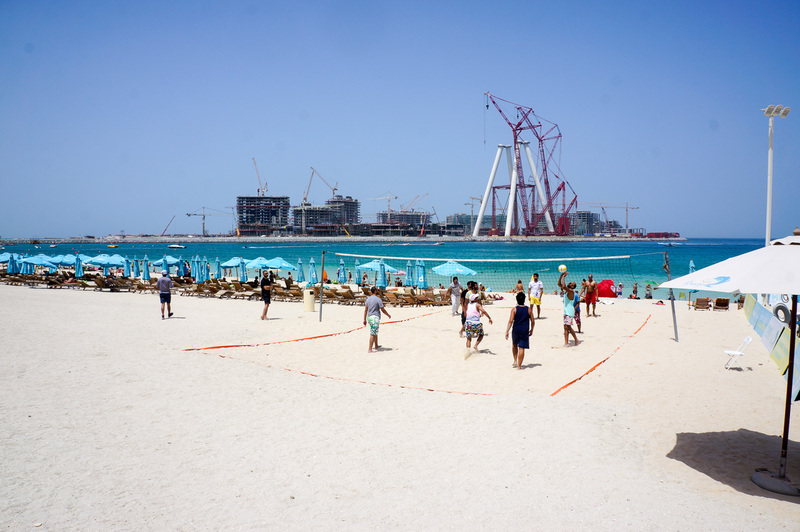 To get the best photo of the Burj, head to the public beach right next to it, pack a picnic and enjoy the views! 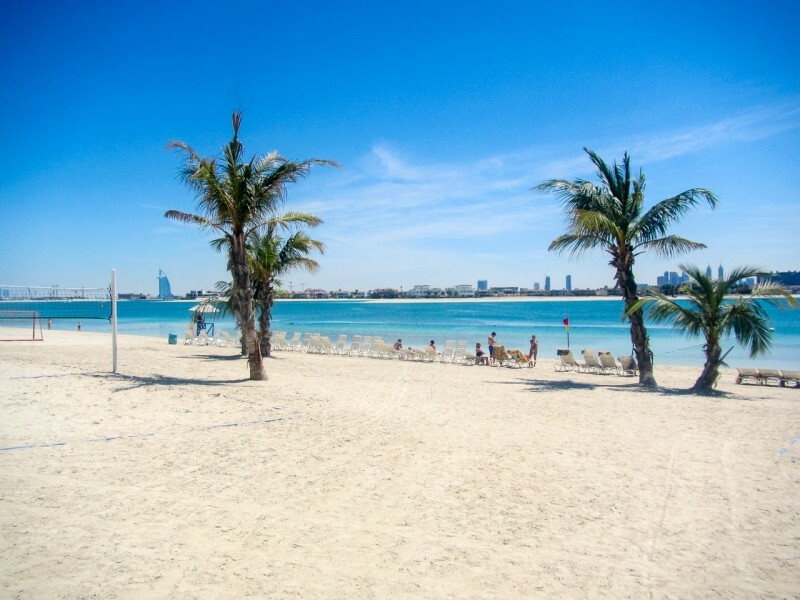 Jumeirah beach – Another Public beach often visited because of the clear views of the Burj Al Arab. It also has toilets, a small fast food restaurant + juice bar, and WiFi available. Kite Beach – This long, clean stretch of white sand off Jumeirah Rd has lots of activities, most notably a lot of kite surfing. During the weekends, tourists and locals flee to this beach making it a popular spot to spend your day. 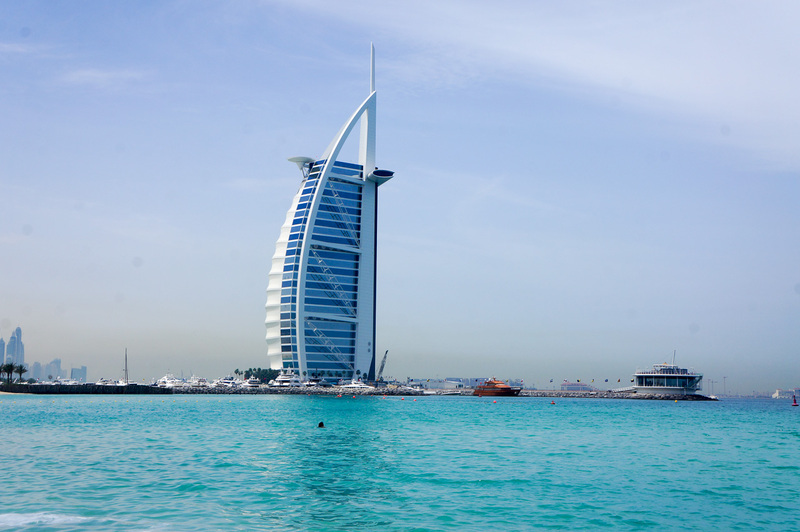 There are showers, toilets and changing facilities, plus great views of the Burj Al Arab. 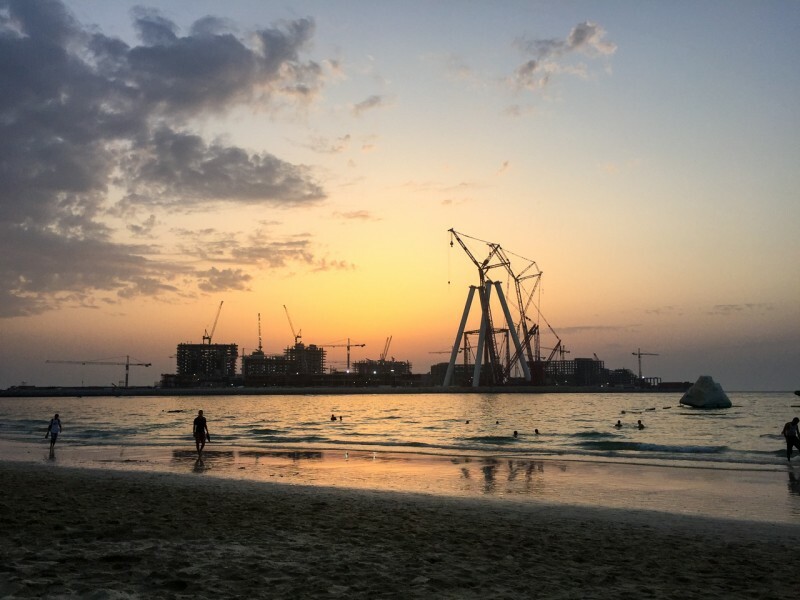 Marina Beach (JBR beach) – Apart from the construction in the distance (world’s biggest Ferris Wheel construction), the waters are calm here and popular with tourists. 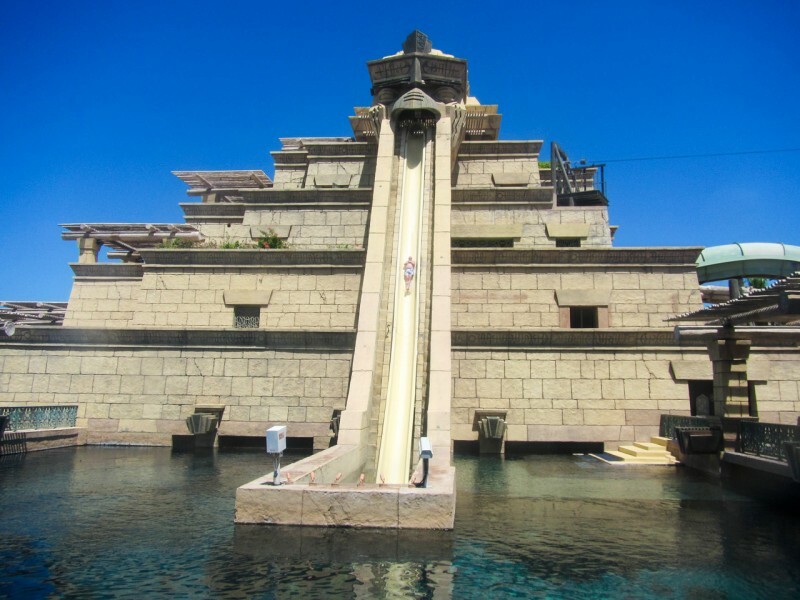 Many of the hotels offer a variety of water sports such as parasailing, jet skiing and banana boat rides. 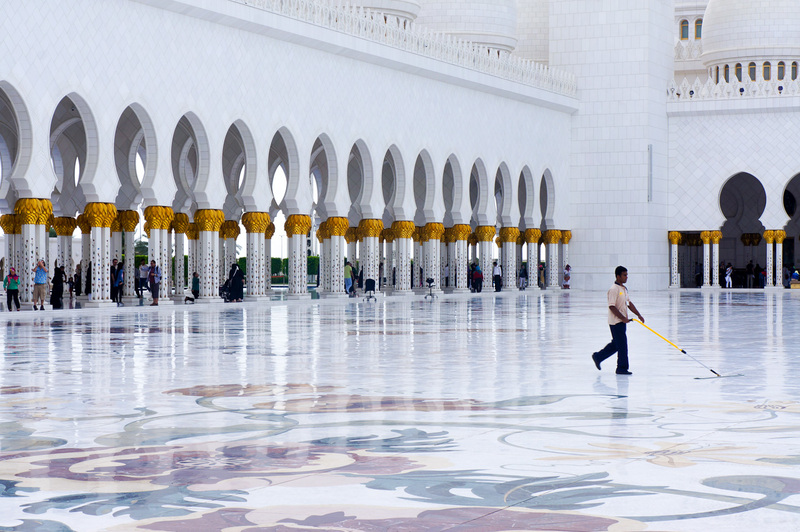 There are abundant cafes and restaurants along with changing facilities and toilets. 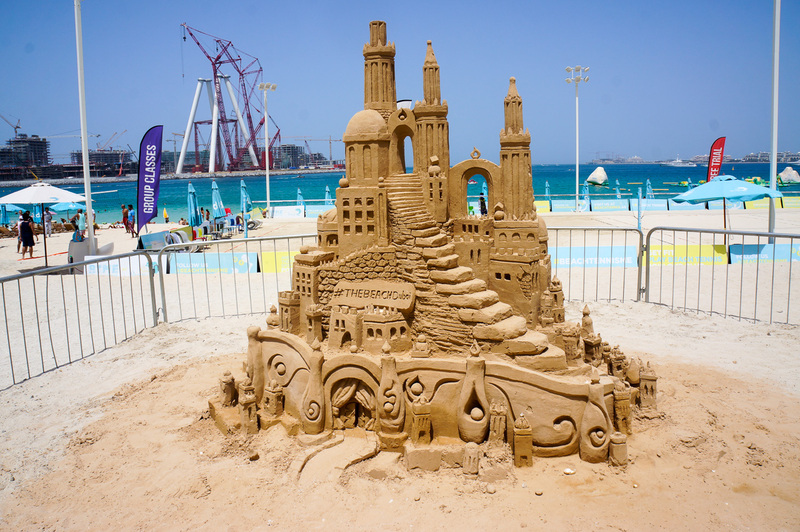 It is by far one of the most fun, family-friendly beaches in Dubai, and the skyscrapers provide a pretty spectacular backdrop. 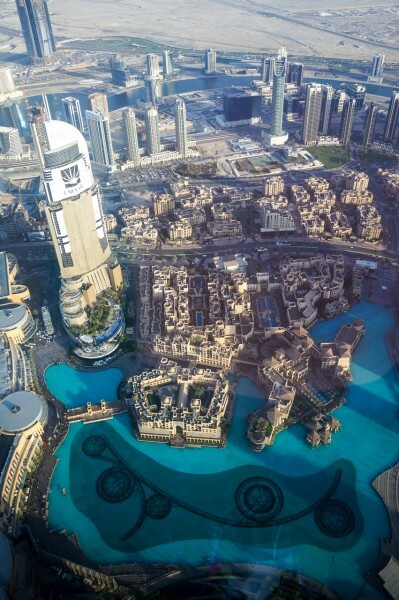 Dubai is BIG. Like BIG BIG. And spread out. One moment you’ll be surrounded by high rises, and the next your right in the open space of the desert. It’s not as easy to get around with public transport as other cities but they are planning to expand the metro in the coming years. 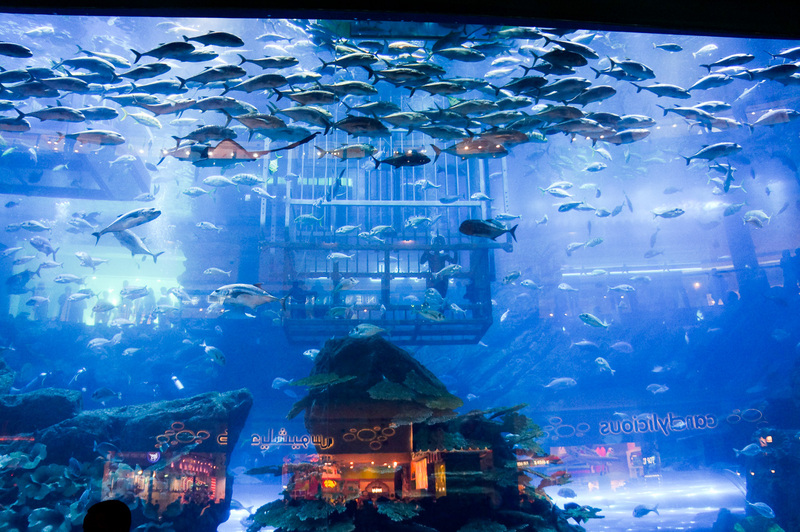 Metro – The metro in Dubai is relatively new and the first line only opened in 2009. Currently, there are 2 lines that service Dubai, the red and green lines. The red line runs directly up the Sheikh Zayer highway (the main road) to the International airport and the green line runs through Deira to Al Quasis. Tickets can be bought at the stations and a day pass is recommended if you plan to take more than 3 rides a day. A day pass is 22 AED ($6 USD) Note; They have women and children only carriages so look out on the doors of the train before you hop in. We learnt this the hard way. Taxi – Taxis are rather cheap (surprisingly) and are always available. Most, if not all will only accept cash. 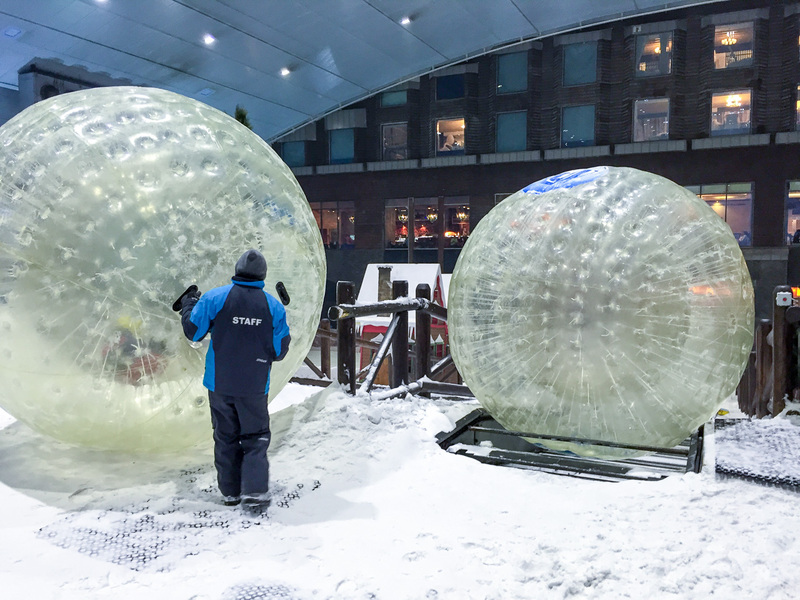 Unless you live on the metro line, this is the easiest way to get around the city. A 10-minute ride was only about $7. 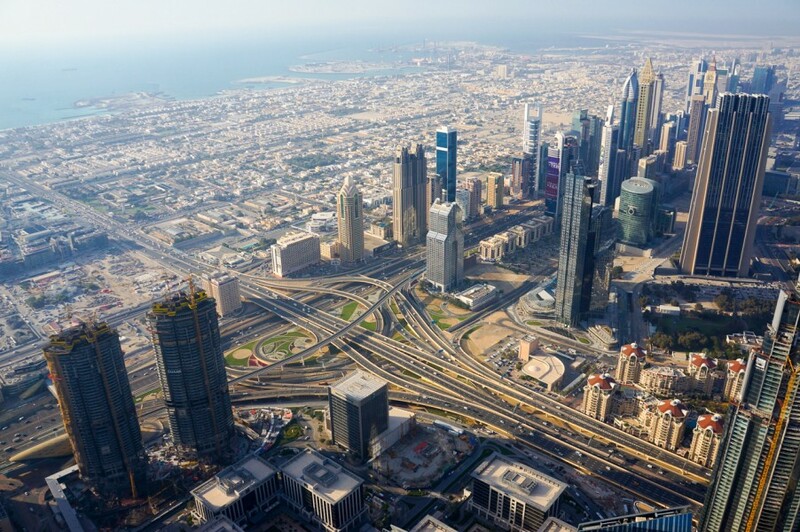 Rent a Car – Owning a car is almost essential in Dubai, they aren’t all that expensive and the gas is very cheap ($0.25 a L) however the roads are confusing as all get out, so it can be slightly stressful! Dubai Tram – A very slow form of transportation running for 14.5 km along Al Sufouh Road from the Marina to the Burj Al Arab and the Mall of the Emirates. Phone a friend – We were very lucky to have a friend in town who owned a car, as well as our host from couch surfing. They drove us around much more than we expected and it really helped! As hotels were too expensive, we spread our 10 days out over Airbnb and CouchSurfing. Staying by Dubai Marina and JBR is a prime location. 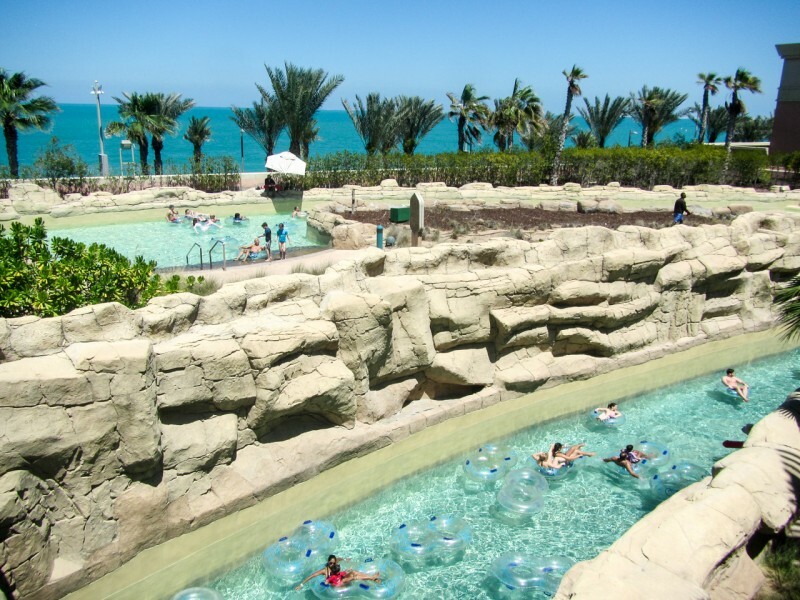 You’re close to shopping, the metro, the Palm and the beach, but of course, this comes at a higher price tag. 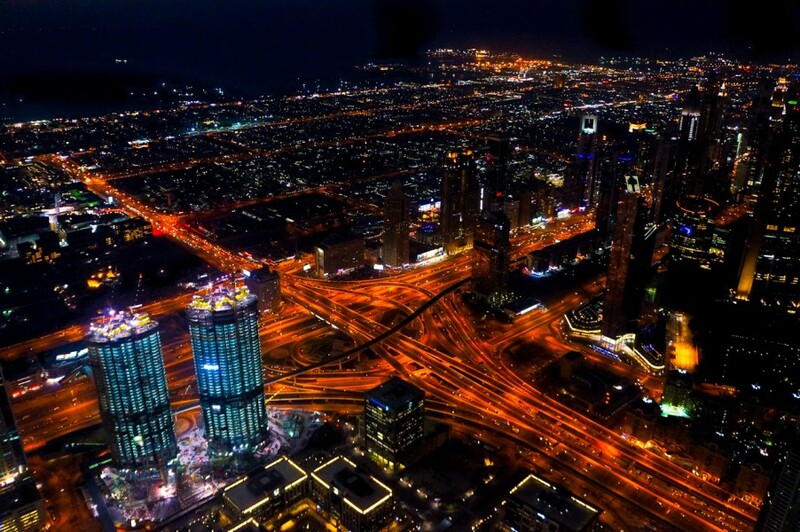 It is one of the most expensive areas to stay in Dubai with hotels starting at a minimum of $90 a night. Instead, we opted for an Airbnb in the same area and paid $39 a night for a marina front apartment in a private room with a gym, pool and a balcony. 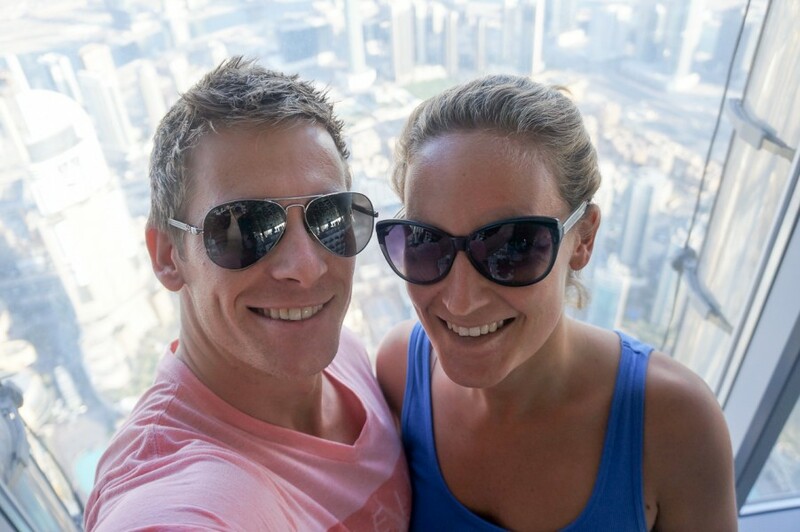 A great option for backpackers in Dubai is Couch Surfing. Surprisingly we haven’t used couch surfing much at all this trip but for our first time of doing so, we got really lucky. 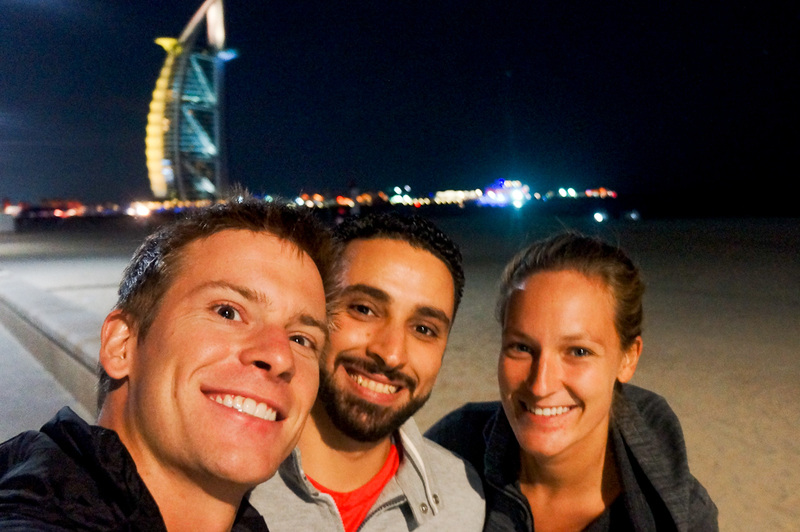 We stayed with Anas, a friendly and generous guy from Palestine who has been living in Dubai for over a year now. 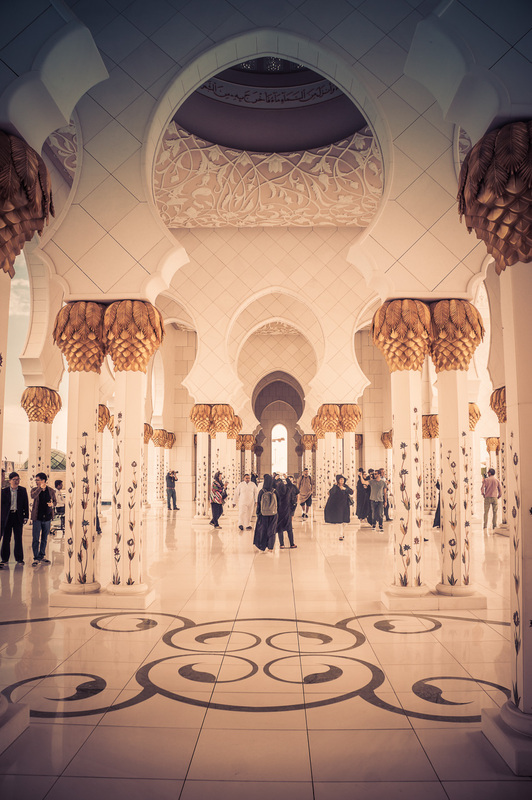 Staying with Anas was such an awesome first experience as we learnt a lot about the Arab culture & the city. Couch Surfing isn’t for everyone. It’s daunting staying in a complete stranger’s house but hey, it’s all about breaking that comfort zone, getting a local’s perspective and of course, saving some cash in the process. 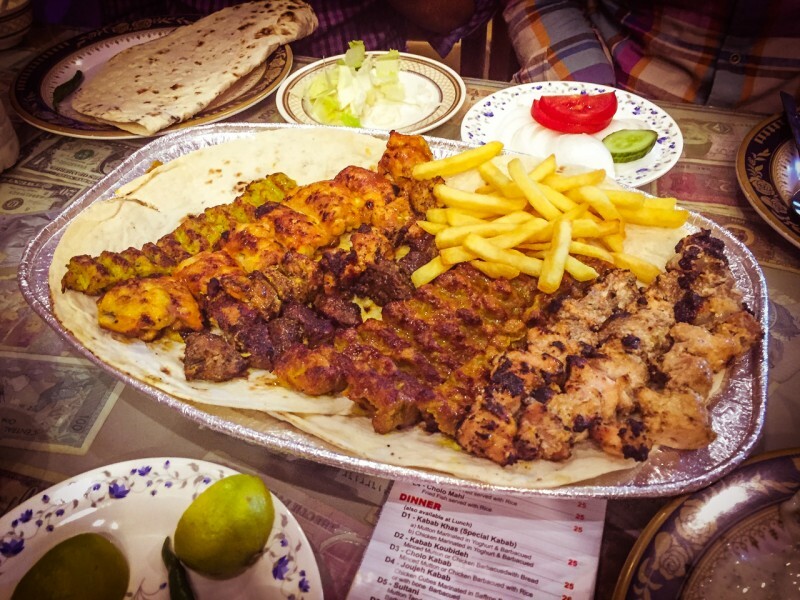 If neither of these options sounds appealing, staying in or near the city centre of Deira is your next best bet. 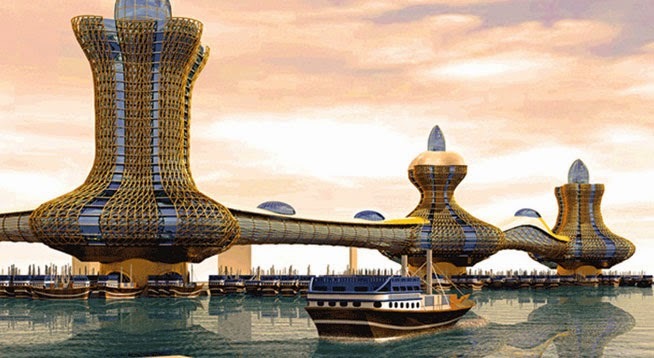 Deira is located on the other side of the Dubai Creek and has recently become more popular with the access to the metro, large shopping malls, hotels and modern apartments. However, be prepared for the longer journeys into the city as it is 30-40 minutes away. Hotels can range from $40-$200 a night. 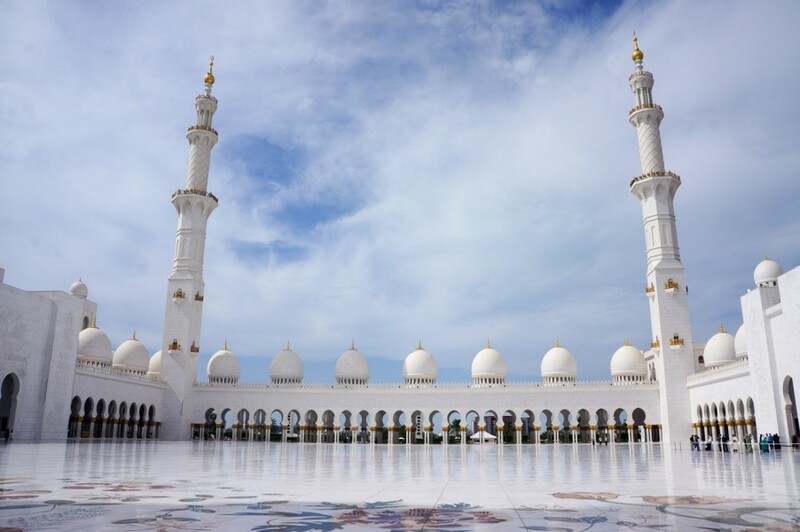 Although not in Dubai itself, a short 1/1.5 hour drive away is another bustling city, Abu Dhabi. We took a day trip out here to visit 2 of its most famous attractions. 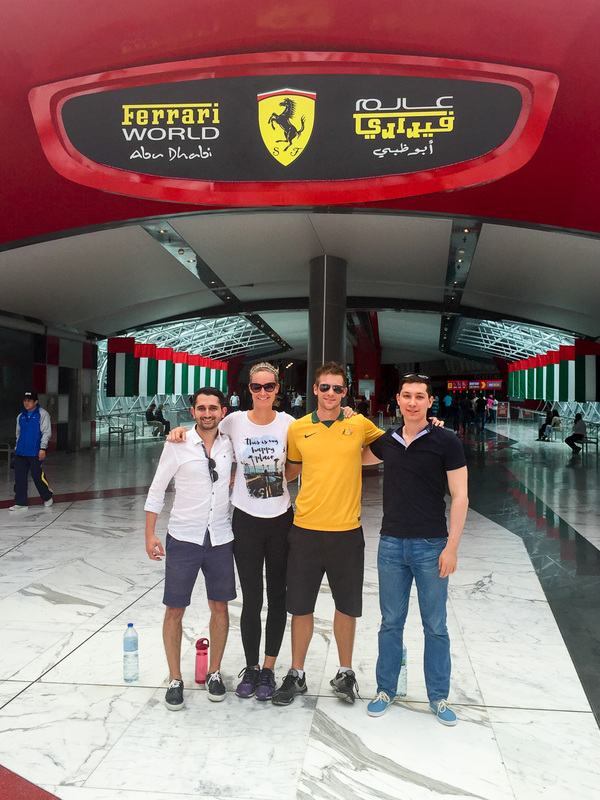 Ferrari world is yet another overpriced tourist attraction but it does have the world’s fastest roller coaster; The Formula Rossa. 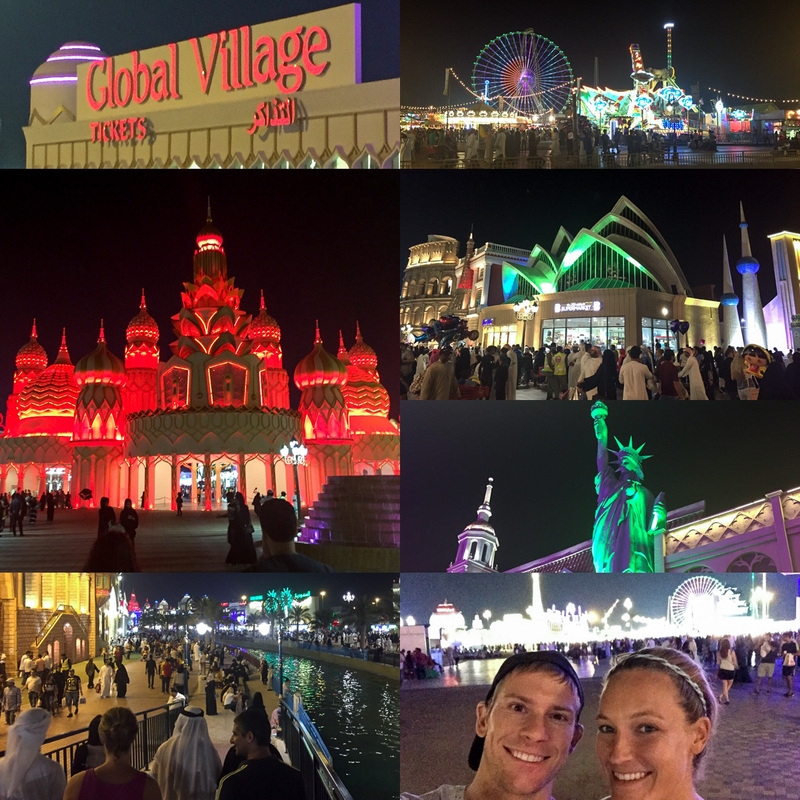 Entry to the park was a whopping 250 AED ($69 USD). 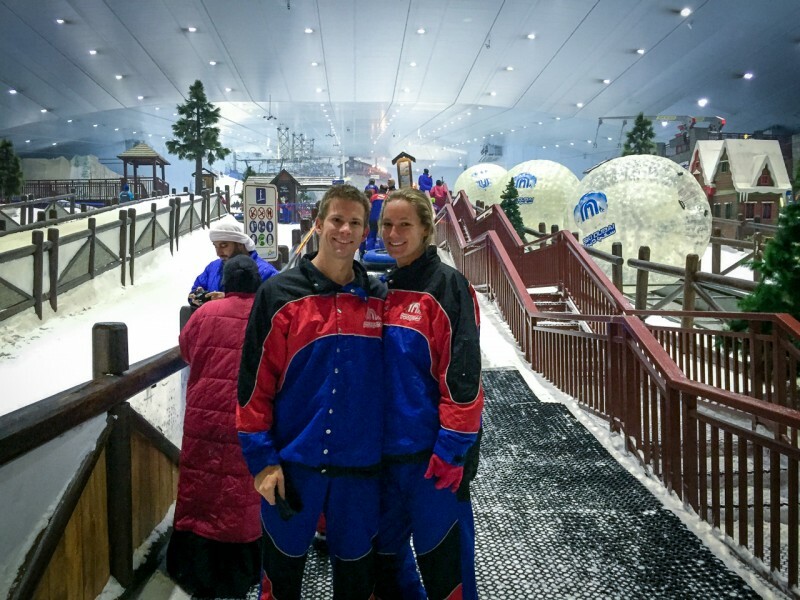 As much as we wanted to head inside, we simply couldn’t justify spending $70 USD to ride a few roller coasters. You have to stop somewhere! 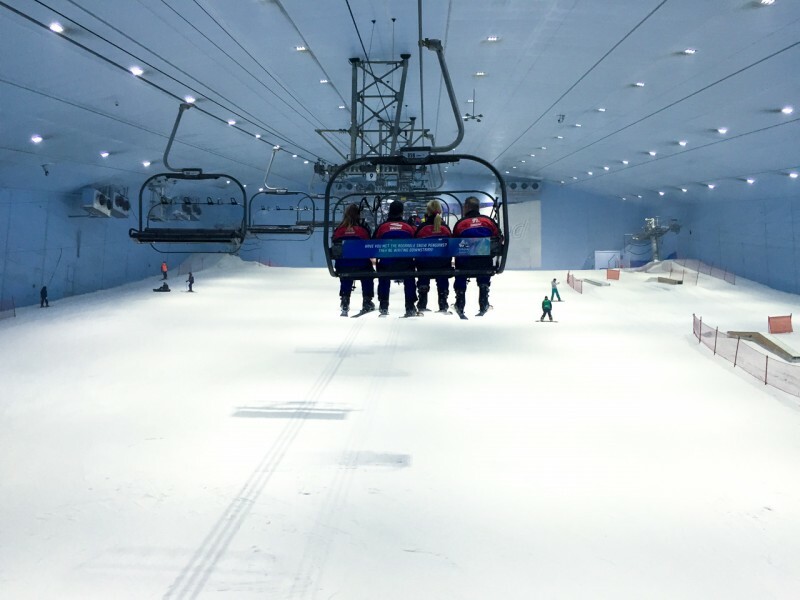 The park itself is mostly indoor, apart from the roller coasters and is a mix of adult and children activities however it did seem more child orientated. 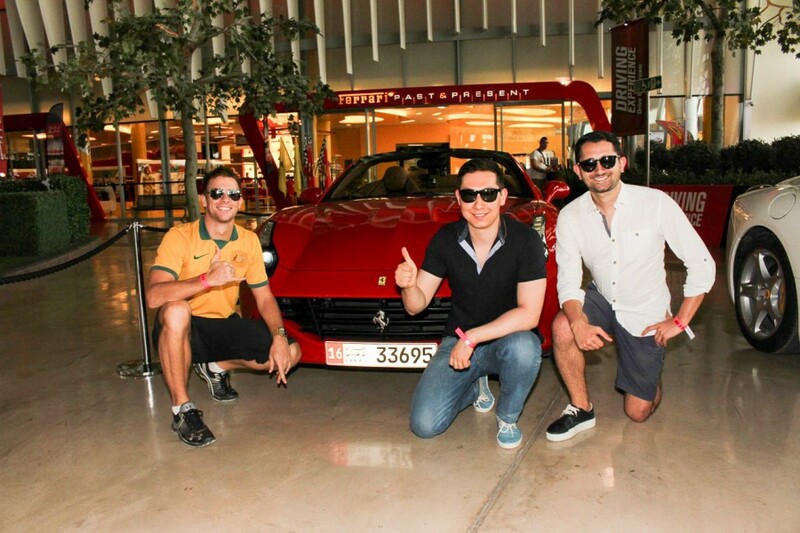 Instead, Jacob and his friends cruised around in a brand new Ferrari. They flew around the streets for 20 minutes and felt the power of the fancy red car. 0 to 100 in 3.6 seconds! Note: This is a separate cost to the entrance of the park. 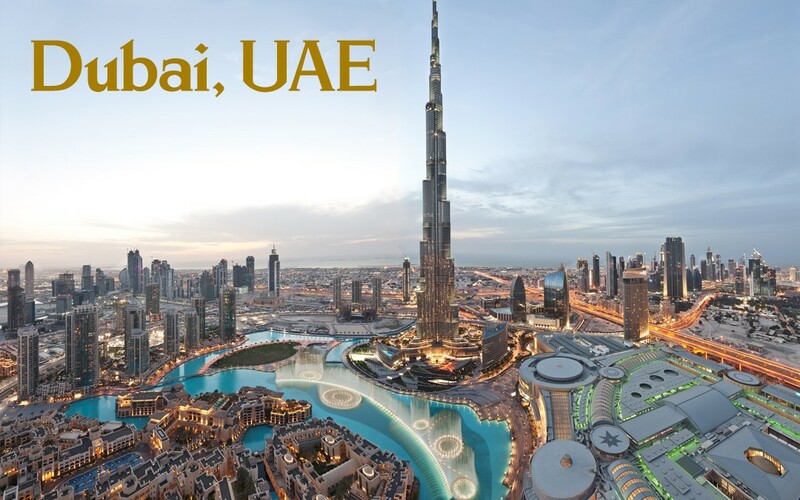 Driver fee; 795 AED ($218 USD) and passengers 100 AED ( $27 USD). One of the most impressive buildings we’ve ever seen. 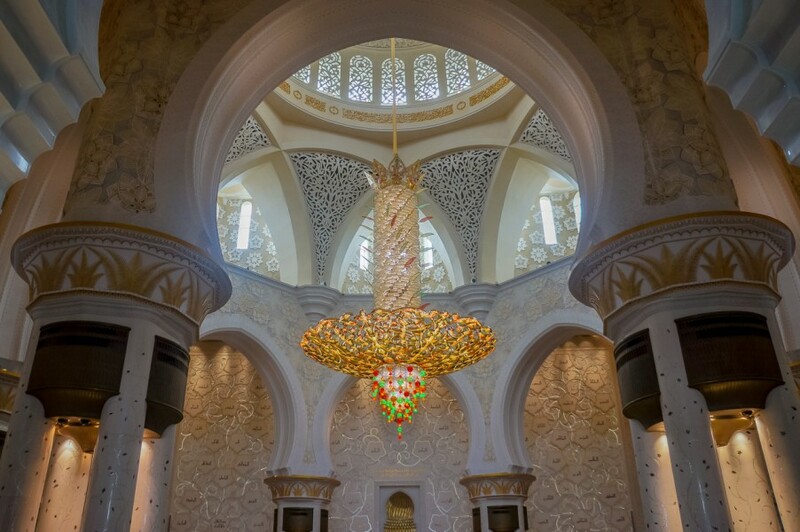 On December 20th, 2007, this Mosque opened to the public after nearly 12 years of construction. 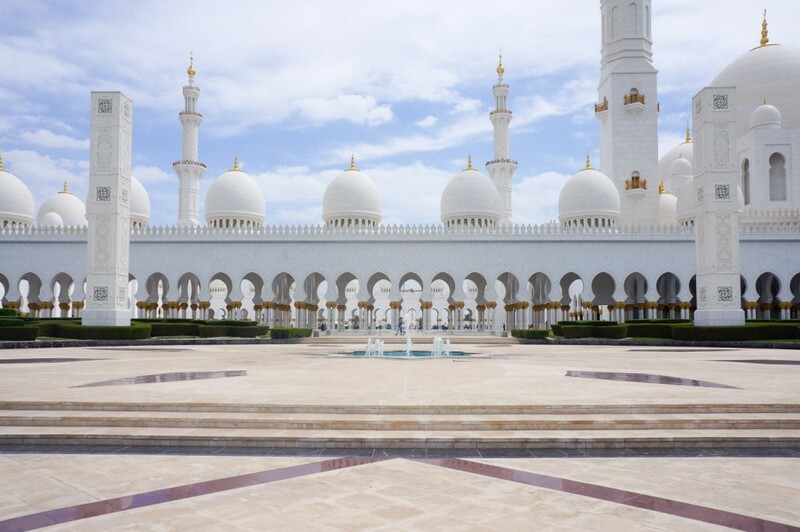 We’ve seen a lot of buildings, churches and mosques in our travels but this one was breathtaking. The details were so fine, the building was so clean and the ceilings were jaw-dropping. 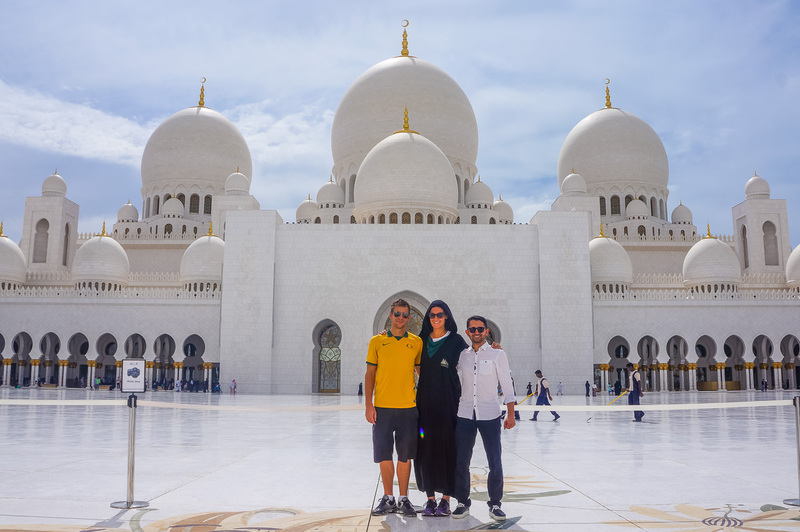 The Sheikh Zayed Grand Mosque is the 3rd largest Mosque in the world and you can visit any time between 9:00 am-10:00pm every day except Fridays. Note; It’s very important to dress appropriately whilst visiting the Mosque. Shorts over the knees and T-shirts for boys, girls, fully clothed, no tight clothes and head scarfs are necessary. 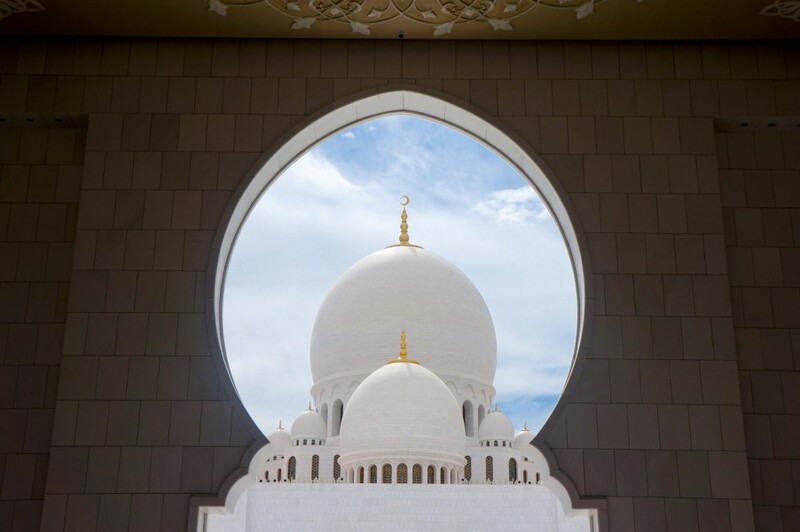 Should you not have correct clothing, they provide appropriate clothing at the South End entrance of the Mosque only. 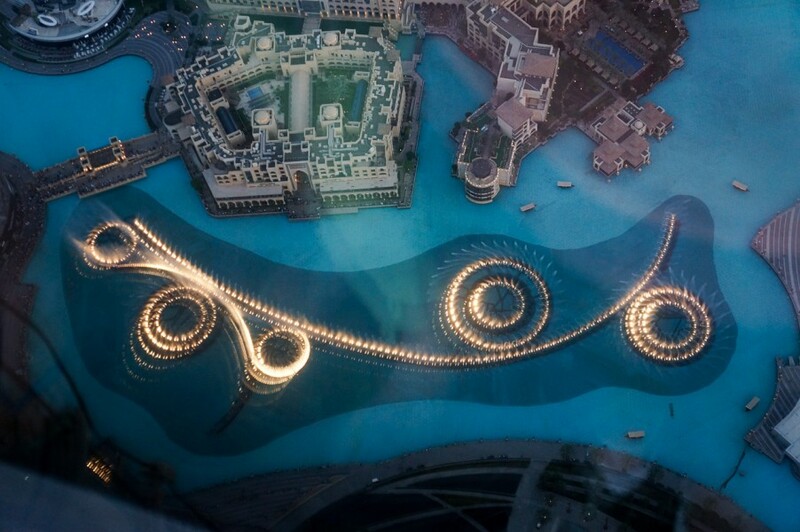 As if Dubai isn’t already the most ridiculously over the top city, they obviously feel they need more! This new list of ‘Dubai’s newest tourist attractions’ is out of control. Check out the new list and see for yourself. I wonder how many more “worlds biggest” they can get! Whilst this city is no doubt an expensive in every aspect, it’s definitely still worth the visit. There are a lot of things to do & unique places to visit but considering they don’t come at a cheap price, plan your trip wisely. 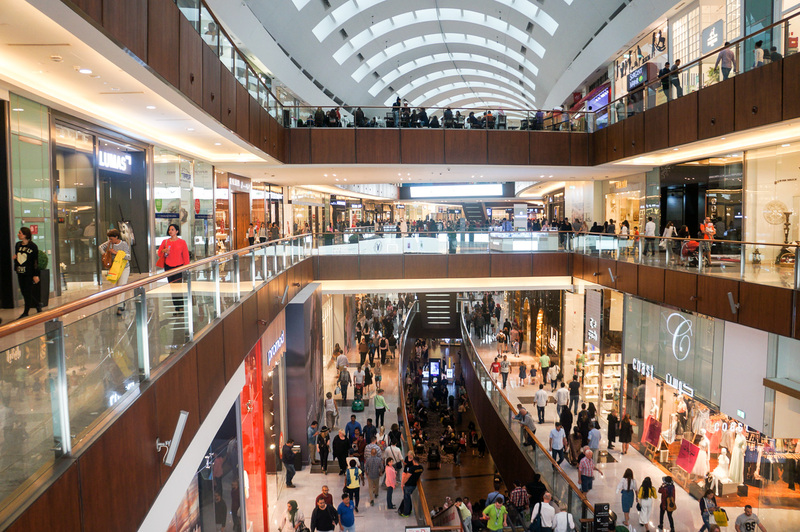 So realistically how long do you need to spend in Dubai? We spent 10 days there with 2 full working days, so 3-5 would be fine. 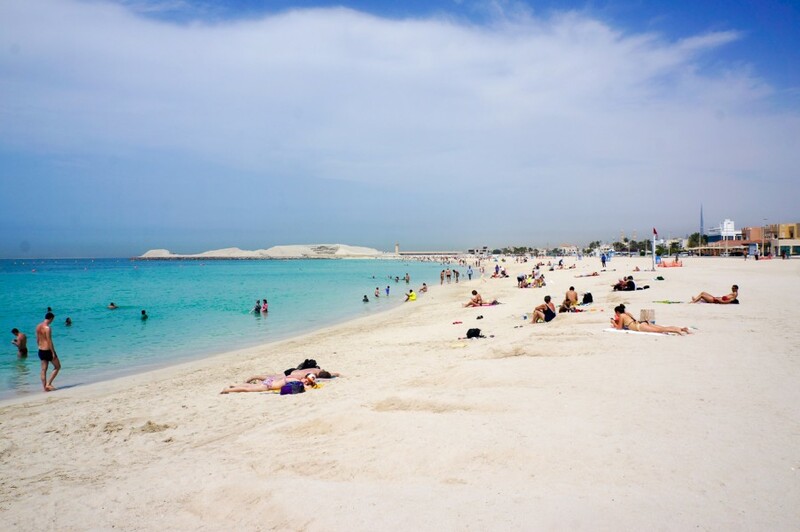 Add another day if you want to visit Abu Dhabi and more if you want more chill beach days. Thanks Jack! 🙂 Hope all is well with you. Jacob Cass in Dubai! Great to see that you both were in UAE last year, and unfortunately, we couldn’t meet. I really liked the way you attribute our country and will hopefully be waiting for your next trip, cuz I’ll be there to be your host. Thanks, Regards Sarah from Logo Design Dubai. Thank you, it was a great time, glad you liked our post! 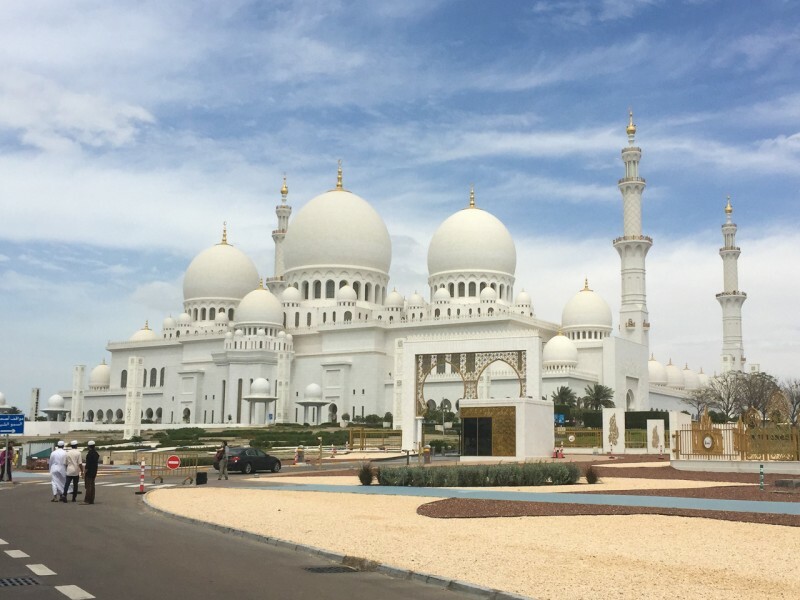 There are lots to see in Dubai which make your trip inspiring experience.Thanks For sharing information, it is very helpful for people who visit Dubai you want to explore new things, Dubai day trips provide best packages for a perfect tourist destination.